On 24 July 1835, Isaac D’Israeli, author of the multi-volumed Curiosities of Literature (1791-1834), wrote T. F. Dibdin, the bibliographer, about his “ONE HUNDRED AND SIXTY designs . . . of Blake’s” (Reminiscences 788; Bentley, Blake Records 243, hereafter cited as BR). D’Israeli’s collection consisted of The Book of Thel copy A, The Marriage of Heaven and Hell copy D, Visions of the Daughters of Albion copy F, America a Prophecy copy A, Songs of Innocence and of Experience copy A, Europe a Prophecy copy A, The Book of Urizen copy B, and one separate plate, either “A Dream of Thiralatha” copy B, “The Accusers” copy H, or “Joseph Arimathea Preaching” copy H (Bentley, Blake Books 157, hereafter cited as BB; all references to plate numbers follow the order established in Bentley’s bibliography). *↤ I am grateful to Mark Reed, Robert Essick, and G. E. Bentley, Jr., for their close and critical reading of an early draft of this paper, for their corrections, and for their many helpful suggestions. The seven books made D’Israeli’s illuminated book collection one of the most comprehensive of its day—and one of the most impressive, for they are all large folio copies printed on one side of the leaf. As we shall see, they share other bibliographical details that suggest they were printed at the same time, possibly in early 1795, which in turn suggests the possibility of their being commissioned as a set. None has a history before 1835, which means that theoretically each could have been purchased either directly from Blake, as Keynes and Bindman ascertain (Census xviii; Blake as Artist 96), or from other collectors. The ideas, however, that D’Israeli visited “Blake as early as 1794 [date of the paper used in these volumes], and bought a wide selection of Illuminated Books,” and even that he was “a member of the Joseph Johnson circle” in the early 1790s (Bindman, Blake as Artist 96), are based on nothing more substantial than his having been a contemporary of Blake’s and having owned illuminated books. Even Keynes found the association between Blake and D’Israeli “curious, for [D’Israeli] made no reference to Blake in his writings . . .” (Census xviii). One purpose of this essay is to question the assumption that D’Israeli was an early Blake patron and collector, and to suggest that he probably purchased all his books late and most of them from the collection of George Romney, whom a recent discovery shows to have been both a collector and a patron. Another and more significant purpose is to suggest that Romney purchased his books from stock, instead of specifically commissioning them, and that what was true of Romney was true of nearly all owners of illuminated books, which is to say that Romney’s and D’Israeli’s copies, and copies of illuminated books in general, were not, as is generally assumed, produced “one by one” (Grant 281) and “on demand” (Essick, “Materials” 857), “as [Blake] got commissions” (Davids and Petrillo 154), or “with a particular customer in mind” (Erdman, Poetry and Prose 786). At first sight, the relation between Romney and Blake is marked by a lack of documents similar to that marking the relation between Blake and D’Israeli; there are no letters, diary entries, and, until now, no known works by either artist in the collection of the other. The absence of a documented biographical connection, of course, does not preclude aesthetic influence, and may simply be because Romney stopped keeping his diary in 1795, and because from 1795 to the summer of 1799, when Romney left London mentally debilitated, there are only five Blake letters extant (three to Cumberland, two to Trusler), and no letter from the 1780s. Indeed, circumstantial evidence and aesthetic similarities suggest very strongly that they met, probably in the early 1780s through their mutual friend John Flaxman, who was ever “anxious to recommend [Blake] and his productions to the patrons of the Arts . . .” (Bentley, BR 26, Smith).1↤ 1 The eye tells us what documentary evidence does not, that Blake must have seen Romney’s paintings and pen and wash drawings in the 1780s, probably before he invented illuminated printing, since motifs in his earliest relief etchings appear to echo specific Romney designs. The Urizenic figure in the clouds in All Religions are One plate 4, for example, is thought generally to have been influenced by the pen and wash drawing, “The Spirit of God Floating over Chaos,” though it is more likely indebted to a lost painting entitled “Providence Brooding over Chaos,” which was renamed “Jupiter Pluvius” by Romney’s son and described as representing “a venerable old man borne upon the clouds. He fronted the spectator, and had his arms outspread; his hair was parted on his forehead, and his beard flowing” (Memoirs 98-99). The drawing, on the other hand, is of a beardless youth or female and appears to have been the source for the female figure floating over the corpse in Marriage plate 14. Because of John Romney’s description, the drawing has often been confused with the painting (see Hagstrum 202). For Blake to have borrowed in these ways meant meeting the man himself, for these were paintings and drawings in Romney’s private collection. Some of these productions Flaxman apparently showed “Mr/: Romney,” who thought Blake’s “historical drawings rank with those of MI/: Angelo” (BR 27-28). begin page 49 | ↑ back to top Flaxman also “recommended more than one friend to take copies” of illuminated books (Gilchrist 1: 124). Of Flaxman’s friends, though, only “a Mr. Thomas,” who purchased Songs copy Q for 10 pounds around 1805, has been identified conclusively.2↤ 2 Gilchrist 1: 124. Charles Augustus Tulk, who owned Songs copy J, was also a close friend of the Flaxmans; see BR 241-42. Flaxman practiced what he preached, commissioning Blake in 1797 to illustrate Gray’s Poems, apparently as a birthday present for his wife, Nancy (Bindman, Blake as Artist 113), and presumably encouraged the publishers to commission Blake to engrave his designs for “A Letter to the Committee for Raising the Naval Pillar” (1799), Homer’s Iliad (1805), Hesiod’s Works, Days, and Theogony (1817), and his article on “Sculpture” in Ree’s Cyclopaedia (1820). He also purchased Innocence copy D and Songs copy O. To this list of friends, however, we can now add Romney, for a previously unexamined auction catalogue from 1834 reveals that he had purchased at least four illuminated books (or five distinct volumes), all of which were described as folio. The books were Visions of the Daughters of Albion, The Book of Urizen, America a Prophecy, and “Blake’s two volumes,” which, as I will show, were probably Songs of Innocence and Songs of Experience. They were auctioned in 1834, two years after the death of his only son, Rev. John Romney, but would have had to have been produced by 1799, the date of Romney’s departure from London. Romney’s owning a set of illuminated books proves that his admiration was both genuine and not limited to the early drawings or to the 1780s, and that Flaxman, assuming he played agent, merits his reputation for being committed to Blake. More significant than Romney’s owning illuminated books, however, are the illuminated books he owned, for if I have correctly identified the copies, then his collection alters the history of other collections, specifically D’Israeli’s, and also reveals how tenuous and speculative our reasoning is when determining early provenance and identifying contemporary patrons. More important still is the meaning of the visual and technical coherence of these copies and the overt differences of each copy from nearly all those of its kind produced before or after. The existence of a uniform set of various titles raises important questions about how illuminated books were produced and why. William Hayley met Romney in Eartham, Sussex, in 1777; he remained a close life-long friend and wrote the first biography, The Life of . . . Romney (1809). He employed Blake in 1803-04 to locate the painter’s works, many of which Blake examined in October of 1803 at Saunders’, Romney’s frame maker, “who has now in his possession all Mr. Romney’s pictures that remained after the sale at Hampstead” (Keynes, Blake, Complete Writings 831; hereafter cited as K). Held in 1801, a year before the painter’s death, the “Hampstead sale” was an auction of Romney’s furniture and large collection of antique busts.3↤ 3 Mr. Read, a friend of Romney’s and of Romney’s earliest patron, Mr. Braithwaite, promised to show Blake a “Catalogue of [the] Hampstead sale” (K 836), though no paintings or drawings by Romney (or Blake) were then auctioned. It was “A Catalogue of the Capital Collection of Casts from the Antique: among which are the Apollo of Belvidere; Castor and Pollux, and the Laocoon; A Very Fine Skeleton; Various Basso Relievos, Busts, and Fragments, Being the entire Collection of that celebrated Artist, George Romney, Esq. At his late Residence, Holybush Hill, Hampstead. Also, His Genuine househould Furniture and other effects, which will be sold by Auction by Mr. Christie on the Premises, On Monday, May the 18th, 1801, at twelve O’clock.” Some of the pictures which were auctioned six years later were then on view: “A Select Part of the finest Works of Mr. Romney, may in the mean Time be Viewed (with Tickets) on the Premises, where the same may be treated for by Private Contract” (Yale Center for British Art, Sales Catalogues 96). It was not until 1805 and 1807 that Romney’s extensive private art collection and his paintings and drawings were auctioned. On 22 and 23 May 1805, the “Intire and Genuine collection of Prints, Books of Prints, and Drawings of George Romney, Esq., Historical and Portrait Painter, deceased,” was auctioned by “Mr. T. Philipe, at his Rooms, Warwick Street, Golden Square, adjoining the Chapel” (YCBA Sales Cat. 649). This collection consisted of thousands of prints and drawings of the Italian, Dutch, Flemish, French, and other schools, but contained no original works of Romney’s.4↤ 4 Lot 121 of the first day lists ‘’38 Varied [drawings],” which could conceivably have included a few of Blake’s drawings. Nearly all the prints and drawings in this sale were after or by masters, like Poussin, Titian, Rosa, Romano. Romney’s collection of art books, prints, plaster casts, paintings, and drawings must have been of enormous educational value to young artists like Blake and Flaxman. The instructional value was greatly increased by Romney’s drawings after Raphael and Michelangelo, whose works in the Vatican, including all the Sibyls and Prophets in the Sistine Chapel, he studied closely and copied, having erected scaffolding for the purpose (Chamberlain 71). Two years later, on 27 April 1807, at Christie’s, Romney’s own paintings and drawings were auctioned, but sold for ridiculously low prices, with the best of them being bought in by John Romney.5↤ 5 The works were bought in for “£406.19s.6d.,” while the total amount realized by the works “actually sold was £307.ls., which when commissions and duty had been deducted, was reduced to £250.16s.” (Chamberlain 233). The copy of the lower half of Raphael’s “Transfiguration,” for example, which Romney painted in oil to size and for which he was once offered £100, realized £6 (Chamberlain 231). No Blake work was listed in either sale, but probably four illuminated books (or five separate volumes) were sold at Christie’s on 9-10 May 1834, when the “Collection of Pictures, Reserved after the Death of that Celebrated and elegant Painter Romney” were again put up for auction.6↤ 6 Auction catalogue of Messrs. Christie, Manson, and Christie, Friday and Saturday, 9-10 May 1834. This auction consisted of the original works bought back in 1807 (listed as lots 72-92 of the second day of the 1834 sale), and works from Romney’s library and art collection which sold the first day of the 1834 sale and included “fine Heads by Rembrandt, Vandyke and Dobson; a pair of spirited sketches by Rubens, copies from Titian . . . the works of Montfaucon, Picart, The Galleries of Dusseldorf and Crozat, and other Books of Prints and Works of Art” (YCBA Sales Cat. 96). The art collection and library, which in addition to Picart, Montfaucon, and Crozat included the most important reference works of the day, such as Basan, Mengs, Webb, Shee, Strutt, Pilkington, Boydell, Richardson, Caylus, and DePiles, had been shipped in two parts to Whitestock Hall, the family home in Kendal, Westmoreland, in 1799, when John Romney came to retrieve his father, and then in 1803, when Saunders packed up Romney’s works and “sent a great part of them to the North” (K 832). The illuminated books, it appears, were among the works “reserved” after the painter’s death and kept in the family library at Kendal, and probably not among the purchases of John Romney. Blake’s dealings with the son were on Hayley’s behalf and apparently through the mail.7↤ 7 A book with a Blake engraving that was published after the painter’s death was listed in the catalogue: lot 9 “Hoare on the Arts,” which may have been his Academic Correspondence . . . on the Present Cultivation of the Arts of Painting, 1804, or his Inquiry into the Requisite Cultivation and Present State of the Arts of Design, 1806, both of which contain frontispieces engraved by Blake. The son continued to add to the library, but did not necessarily purchase this or any other work from Blake. 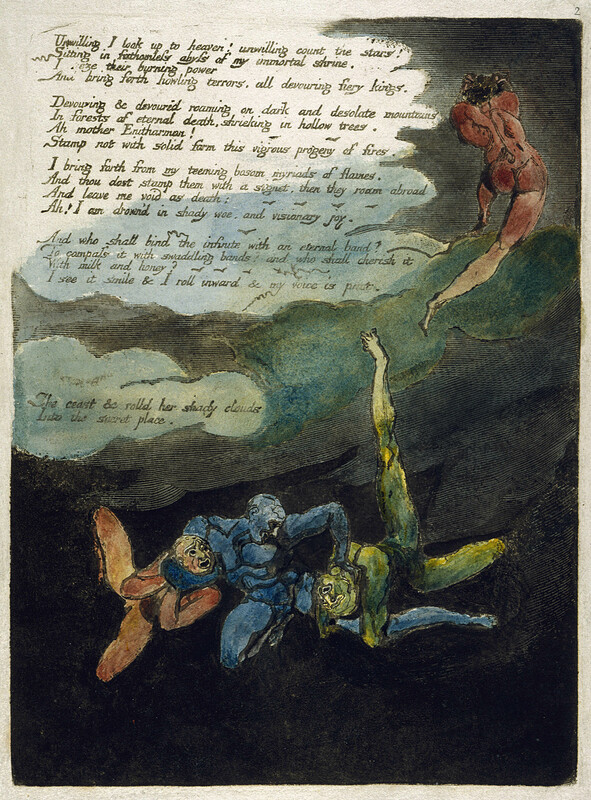 The illuminated books sold as lot 79, “Blake’s Visions of the Daughters of Albion—Coloured”; lot 83, “Blake’s America, and Blake’s Urizen—coloured”; and lot 86x, “Blake’s two volumes.” Visions sold for 11 shillings to “Evans,” probably the dealer R. H. Evans; America and Urizen sold for £1.4, also to Evans; and the “two volumes” sold for 18 shillings to Tiffin, possibly Walter E. Tiffin, “An Old-Established Printseller.”8↤ 8 Auction catalogue of Messrs. Christie, Manson, and Christie, Friday and Saturday, 9-10 May 1834. There are two copies of the catalogue in the Yale Center for British Art, one without prices, the other with prices and a handwritten “86x” added but with no owners cited (Sales cat. 96). The buyers are listed in Christie’s master copy in London, a reproduction of which G. E. Bentley, Jr. generously checked for me. The “Large Collection of Engravings & Drawings” of Walter E. Tiffin, “An Old-Established Printseller, Relinquishing the General Business . . .” sold at Sotheby’s, 29 Feb.-9 Mar. 1860, and contained three water colors from Blake’s The Story of Joseph series, c. 1784-85 (lot 1826). See Butlin Paintings and Drawings 1: 59 (nos. 155-57). This printseller’s retirement from the business in 1860 indicates he would have been in the business of attending auctions in the 1830s. Lot 86x was handwritten in the same brown ink as the prices, suggesting, perhaps, that the two volumes were overlooked during cataloging. Like lots 79 and 83, lot 86x was listed among the “Folio” books, which is probably an accurate description of size, since the books could also have been listed as octavo or quarto, the other book categories. Folio, of course, indicates a printing format, but was hee used in its general sense of a book with page height of 30 cm or more. “Folio” does not help us to identify the specific copies of Visions or America, since all copies of these begin page 50 | ↑ back to top books (as well as of Europe) were folio and were so listed in both Blake’s 1793 prospectus (K 207-08) and his 1818 list to Dawson Turner (K 867). But it may help us to identify the copy of Urizen, which Blake had listed (along with Thel, Marriage, and Milton) as quarto. There are eight copies of Urizen, counting copy E, which is untraced, and copy J, which was recently rediscovered by Detlef Dörrbecker (Dörrbecker 60n1). Of these, only two copies (A and G) have known histories that preclude their consideration. Copy G was printed in 1815, after Romney’s death (1802), and copy A was probably “acquired by the 1st Baron Dimsdale (1712-1800)” and stayed in his family till 1956 (BB 180). These two copies are also precluded by size, as are all but one of the other copies, for they are all less than 30 cm in height and probably would have been described by a cataloger as quarto. Only copy B, the copy owned by D’Israeli, is folio: 37.4 × 27.1 cm. This copy is different from copies A, C-F, and J, in another important respect. Though it is recorded as being color printed in brown and green inks like other copies of Urizen (BB 168), it is neither color printed nor in brown ink. Except for plate 2, which was printed in green, the ink is light black; its brownish tint in the text is due primarily to the thin ink layer on off-white paper (see n. 12), something a magnifying glass and a comparison with the illustrations (particularly the solid relief areas) clearly reveal. It appears color printed at first glance because the black color on impressions is opaque and a few impressions have colors that are thick and slightly reticulated. 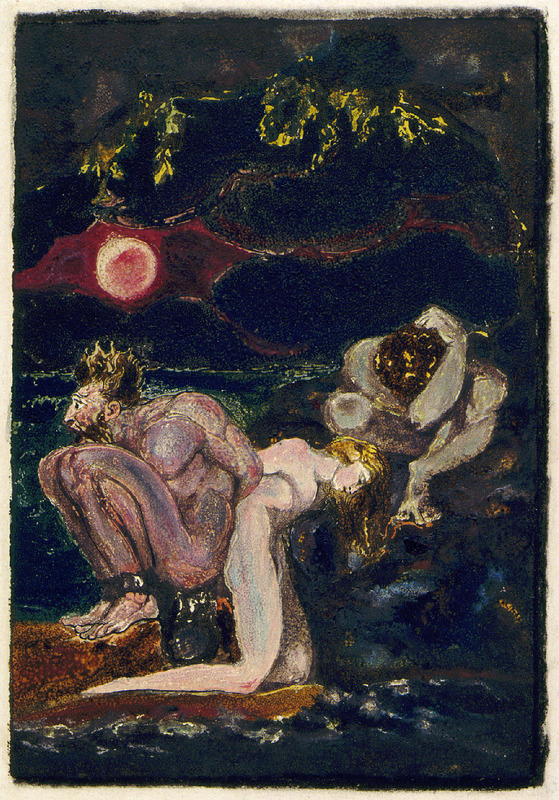 But the colors were not printed from the shallows, as they were in the other copies of Urizen, and the opaque colors that appear to have been printed from the relief areas were actually applied to the impressions, the technique used to produce deep blacks in America copy A and many other copies of illuminated books (Viscomi, “Recreating Blake” 10-11n16).9↤ 9 Some impressions in Urizen copy B appear color printed because the black ink was gone over on the paper, possibly while wet, in green (pls. 18, 20, 23), grey, and black washes to produce a mottled effect. Part of Los’s right knee in plate 7, for example, appears color printed, but the capillary formation of the ink on the relief area that forms the knee is the same in the part not color printed as in that color printed. The difference was created by the latter being washed over in grey and black opaque paint. This is even more apparent in plate 8, where the blue opaque paint appears to be from the plate, but was actually applied to the impression over the black ink (a relief plateau), as a close look with a magnifying glass reveals: the blue does not always hold the relief line or area. Plate 19 also looks color printed, but the deep red color is painted over the ink on the impression; the relief area out of which the figures were hollowed was heavily inked, but that ink is black and was applied generously and not delicately because the area’s lack of detail made it easy and quick to ink. The differences in size and printing style suggest that Urizen copy B was printed apart from and, as will be argued in part IV, after copies A, C-F, and J.
and mind, afford[ing] only a gloomy prospect for the residue of his life” (Hayley, in Chamberlain 223). production: it is the only copy of America produced (besides copy O for Linnell in 1821) with the last four lines of plate 4 unmasked.13↤ 13 America copy B is listed in BB as having plate 4 masked (87), but plate 4 in copy B, along with plate 9, are fakes; see my “Forgery or Facsimile? An Examination of America plates 4 and 9,” copy B, Blake 16 (1983): 219-23. I suspect that copy B’s original plate 4 was like copy A’s, because, as the shared ink, paper, and inking accidentals show, copies A and B were printed together (See n. 12). The later printing style and paper size were also used for D’Israeli’s copies of Thel (F), Visions (F), Marriage (D), Songs (A), and Europe (A).14↤ 14 The paper used in all these books is J. Whatman 1794 or I. Taylor. America copy A is now 32.0 × 23.3 cm, apparently cut down from approximately 38 × 27 cm, along with plates 1-2, 4-6 of D’Israeli’s copy of Europe copy A, his Song of Los copy B, plate 1 of his Visions copy F, and the three separate plates, “A Dream of Thiralatha” copy B, “The Accusers” copy H, and “Joseph of Arimathea Preaching” copy F. These books and plates, which were bound “somewhat irregularly” by 1856 (BB 474n1), were probably trimmed after 1835, when Song of Los and two of the separate plates came into D’Israeli’s collection (BB 156n). (The leaves of the other five copies of Song of Los are a quarter of royal crown paper, which was approximately 36 × 26 cm) Urizen copy B and America copy A may have sold as one lot because they were stabbed together, but this is impossible to tell since America copy A has no stab holes, perhaps because it was trimmed. The sharing of such specific stylistic features as size, inks, and format—particularly since America was usually monochrome, Thel, Marriage, and Urizen were always quarto, and Songs, with rare exceptions (copies R, V, and W), was always octavo—suggests that these copies were printed around the same time as a coherent set. With the exception of Visions and Thel, whose plate numbers were etched in relief and are part of the design, these volumes were numbered in pen by Blake, whereas early copies of Songs, America, and Marriage were not, and this too suggests a coherent set. That one of the books from this set (Urizen copy B) appears to have been owned by Romney suggests that the copy of America with which it sold was copy A rather than the earlier and very differently formatted copy K, which was probably one of the copies of America that Blake advertised in the 1793 prospectus as constituting the “numerous great works now in hand” (K 208).15↤ 15 Bentley dates America copies C, D, and H c. 1796 because they have only one serpent tail in plate 13, reduced from three (BB 87). An alteration of this kind, though, is technically very minor, requiring at most a few hours’ work with a scraper. The evidence is not firm enough to warrant dating these copies two and three years later than the other recto-verso copies with which they have more in common, stylistically and materially. The frontispiece of America copy K sold anonymously in 1904 “with property evidently once in the D’Israeli Collection” (BB 103). This suggests the possibility that America copy K was the copy that sold with Urizen copy B, but that its plates 2-18 were sold off and replaced by America copy A. The early provenances of plate 1 and plates 2-18 of America copy K are not known, but if D’Israeli’s and his son’s arithmetic can be trusted, then plate 1 probably entered the collection after 1862, when Lord Beaconsfield described having “170 Drawings etc By W. Blake” (BB 156n). The 10 plates added to the collection since 1835, when it was described as having 160 designs, can be accounted for by the eight plates of Song of Los copy B and two separate plates that were bound “somewhat irregularly” with America copy A and a few other designs by 1856 (see n. 14). Had America copy A replaced America copy K, it would have been before or while copy A was bound with the other plates, and that would put the extra plate 1 in the collection by 1862 for a total of 171 designs. Like Urizen copy B, America copy A appears to have been printed after the book’s initial printing run (C-I, K-L, and R), and to match the style of other books rather than other copies of America. 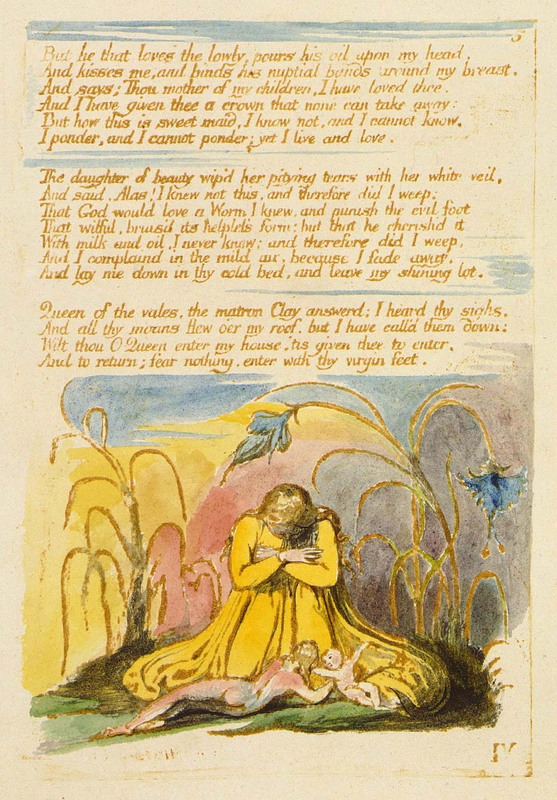 Thus, it seems reasonable to propose that lot 79, “Blake’s Visions of the Daughters of Albion—coloured,” may have been copy F, the copy acquired by D’Israeli by 1835. All 18 known copies of Visions, counting untraced copy Q and the Munich copy recently rediscovered by Detlef Dörrbecker (Dörrbecker 61n8), were printed folio and hand colored. It appears that possibly 15 of these were printed by 1800 and that the early provenance of 10, including copy F, is unknown. But of these 10 copies, only F, G, and the Munich copy were printed on one side of the leaf, the format of Urizen copy B and America copy A. The other seven were printed rectoverso, like the early copies of America, on either undated Whatman paper in light brown or yellow ink, or undated E & P paper in green ink. 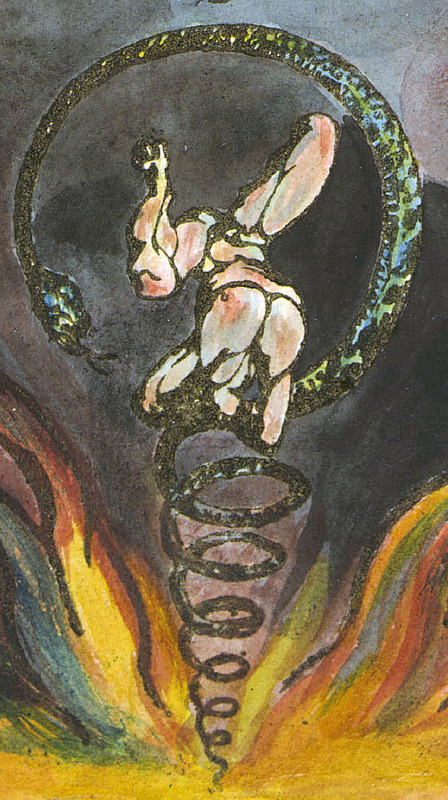 Like Urizen copy B and America copy A, and the other books in D’Israeli’s 1835 collection, Visions copy G was painted in water colors; it was also printed in the light brownish-black ink of America copies A and B and Urizen copy B, whereas Visions copy F and the Munich copy were color printed. But while the early history of Visions copy G is not clear, the later history is; it belonged to D’Israeli’s friend Dibdin and was trimmed and bound with Thel copy J, possibly around 1816, the date of the third flyleaf (BB 128), though probably not by Dibdin.16↤ 16 Both Thel copy J and Visions copy G were produced early (BB 118, 465n4); when and from whom Dibdin acquired them is not known. They are assumed to have been purchased directly from Blake because (using the same logic applied to D’Israeli) Dibdin was a contemporary and owned them sometime after 1816. They could have been purchased, though, after 1824, or even after 1836, since they were “not catalogued with Dibdin’s library, sold by Evans, 26 June, 1817” (Census 23n), or mentioned in his Library Companion (1824) or Reminiscences (1836), the latter mentioning Songs and Night Thoughts (BR 243). It is possible, then, that, as D’Israeli purchased books from Romney’s collection, so Dibdin purchased his bound volume of Thel and Visions from another collector and later than we imagine. Thel copy J differs from other copies by having its two offending lines (19-20) in plate 8 deleted. These were scraped off the paper, which makes the deletion impossible to verify as Blake’s since it occurred after the plate was inked and printed. Thus possibly either Dibdin or the person from whom he acquired it had erased the lines. The kind of deletion that is verifiable, other than masking, was the wiping off of ink, which could only occur after inking and before printing. Copy I, though, has scrolls painted over these two lines, which appear to be in Blake’s hand. While this may seem to suggest the possibility of Visions copy G as Romney’s copy and Dibdin as its purchaser, the fact that it was professionally bound with Thel probably long before 1834 makes that very unlikely, since lot 79 clearly sold as one item; it is also unlikely since, as will become clear, Dibdin appears not to have acquired it or Thel till after 1836.
why lot 79 sold for 11 shillings. At one shilling per plate, this volume cost a good deal more than the other books: 25 shillings for 46 impressions of America and Urizen, and 18 shillings for “two volumes” that may represent 50 impressions. The higher price per impression may reflect more competition than the other volumes (Visions was the first of the books sold), which in turn may reflect a particularly splendid copy. Of all the copies of Visions produced in the 1790s, and of all the illuminated books in the auction (assuming we’ve correctly identified the copies), the color-printed Visions copy F, especially with its stunning frontispiece, is far and away the most painterly and materially substantial (illus. 3). 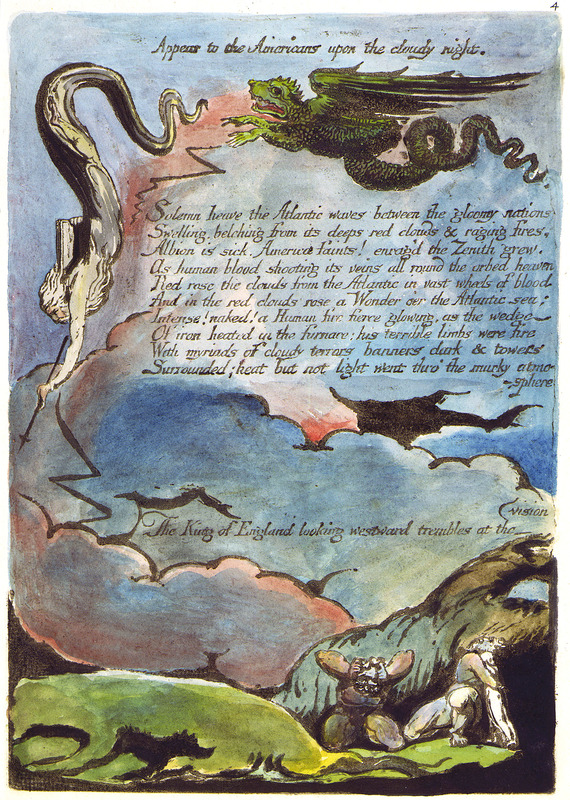 A few years before the Romney auction, Smith had noted the same about works printed in this technique: “Blake’s coloured plates have more effect than others where gum has been used,” for “they are coloured . . . with a degree of splendour and force, as almost to resemble sketches in oil colours” (BR 473, 472). Smith based his assertions “upon those beautiful specimens [the Large and Small Book of Designs] . . . coloured purposely for . . . Ozias Humphry” (BR 473). Smith’s opinion, that the opaque colors characteristic of color printing are more “beautiful” than the transparent tints characteristic of water color drawings, which he equates with their binder, gum arabic, reflects the then fashionable taste for water colors in “imitation of the effect of oil painting . . . the explicit desirability of [which was] the bellwether of a new consciousness of the changing potential of watercolor art” (Cohn 11).17↤ 17 Smith knew that Blake “preferred mixing his colours with carpenter’s glue, to gum, on account of the latter cracking in the sun, and becoming humid in moist weather” (BR 472). But he must have also known that the opacity of size-color or “body-color” was not due to the binder but to an inert pigment, like precipitated chalk, mixed with the colors, which gave them bulk and hiding power. Even with glue binders Blake was able to produce transparent stains. Giving water colors body was one of the ways watercolorists attempted to legitimize their medium as painting and to compete with oil painters. See Cohn for a discussion of this and other techniques that English water color artists used “to establish their medium’s credentials as high art—against painters in oils, who would admit them into the Royal Academy only in 1812 and then segregated them into a separate gallery” (11-16). Given the circumstantial evidence regarding D’Israeli’s ownership of lot 83 and the higher price per print of lot 79, it seems probable that Romney’s Visions was copy F, the copy later owned by D’Israeli. Urizen plates, which together sold for a mere six shillings more. And, as mentioned, unlike Visions copy F, the images of Songs copy A, Urizen copy B, and America copy A were not color printed. They look more like water color drawings than paintings. Perhaps Songs were designated so briefly (“Blake’s two volumes”) because Blake’s name alone suggested Innocence and Experience, his best known works, particularly to an audience familiar with Smith’s Nollekens and His Times (1828) or Cunningham’s Lives (1830). In 1830, a monochrome copy of Songs (copy BB) sold simply as “Blake’s Phantasies,” realizing two shillings more than lot 86x (Census 66). Or, more likely, the auction description may be brief simply because the people in the hall would see and hear what the volumes were when the auctioneer held them up.19↤ 19 This possibility was suggested to me by G. E. Bentley, Jr. In any event, the idea that Romney owned Songs copy A challenges Keynes’ assertion that it was acquired by D’Israeli directly from begin page 54 | ↑ back to top Blake (Census 56). Bentley is more circumspect, stating that Songs copy A was “Probably acquired” by D’Israeli, but certainly “Sold by [D’Israeli’s] son the Earl of Beaconsfield at Sotheby’s, 20 March 1882” (BB 412). Though right to question the idea of a direct purchase from Blake, Bentley appears also to question the purchase itself, which seems unnecessary since without the 50 impressions of Songs copy A (nearly a third of his collection), D’Israeli could not have referred in 1835 to his “ONE HUNDRED AND SIXTY DESIGNS . . . of Blake’s.” To make up this sum, D’Israeli had to have owned either a 50-plate copy of Songs (as opposed to the usual 54-plate copy) or Milton, and he (or his son) is known to have owned the former but not the latter.20↤ 20 Because Songs copy A was numbered in ink by Blake, 1-26 and 1-20, with the frontispieces and titlepages of both sets unnumbered, it is unlikely that its 50 pages were the result of later extractions, though, as mentioned (see n. 18), the three missing Experience plates, 50-52, are the last three plates of Experience of Songs copy R—a grouping found in no other copy. The question, then, is not whether D’Israeli acquired Songs copy A, but from whom and when. The evidence here suggests that he purchased it from (W. E.?) Tiffin, who purchased it at the Romney auction in 9 May 1834, and not from Blake. He acquired it, in other words, from a dealer a year or less before he described his own collection on 24 July 1835. That “Blake’s two volumes” were Songs copy A, as initially bound, and not a compilation of the other three D’Israeli books, Thel copy F, Europe copy A, and Marriage copy D, is supported by two facts. First, these three works have different stab holes (BB 55-56), which means that they were never bound in two. Could any two of the above have constituted “two volumes”? Probably not any two, since Marriage copy D, was stabbed six times, a style Blake used only one other time, for Thel copy O and Milton copy D, which were stabbed together for Mrs. Vine between 1815, the date of the paper used in both books, and 1827 (BB 118). Marriage copy D, in other words, may have remained in the studio in sheets long after it was produced, as did many other illuminated books (see n. 26), and bound only when sold. Were Thel copy F and Europe copy A the “two volumes”? This too is unlikely for it would mean that the “Blakean portfeuille” that D’Israeli had already formed as early as 1824 would have consisted only of Songs and Marriage, which for reasons discussed below is very unlikely. This portfolio, whose size and contents are not known, is generally assumed to have contained the 160 designs of 1835 (BR 289n1). I think this is mistaken; the evidence regarding Urizen copy B and America copy A already suggests that the earlier portfolio was much smaller. Given Dibdin’s description of the 1824 portfolio, I suspect that it consisted of only three illuminated books: Thel, Europe, and Marriage. Though referred to as “drawings,” the works are no doubt hand-colored prints, the term “drawing” revealing the transparency of Blake’s innovative medium, a point made by Smith. “The plates . . . were then printed in any tint that he wished, to enable him or Mrs. Blake to colour the marginal figures up by hand in imitation of drawings” (BR 460).21↤ 21 Linnell described Songs of Innocence and of Experience copy R as a “Book of Designs” (BR 585). Coleridge, in a letter to Tulk, Feb. 1818, referred to Songs as “Drawings” (BR 252). Dibdin (or an assistant who mistook Blake’s first name) also lists in a separately published Index to the . . . Reminiscences D’Israeli’s “letter respecting his collection of drawings by the late T. Blake” (20). They were still being called drawings by D’Israeli’s son, Lord Beaconsfield, who told W. M. Rossetti in 1862 that he had “170 Drawings etc By W. Blake” (BB 156n). The Large and Small Books of Designs copies A were described similarly, selling as “original drawings” in 1846 (BB 356-57). Even uncolored prints, prints not thought of as facsimiles or drawings, were often referred to as drawings. Edward Dayes, for example, states that “drawing . . . possess[es] a divine virtue in its creative power . . . as it preserves the images of distant objects, and the likeness of those we love. Without risking our lives on the boisterous ocean, we may enjoy at home, in a small book, representations of the finest productions of nature and art . . .” (252-53). Drawing as representation refers to “the exact imitation of all the forms and manners which present themselves to our sight” (253), and thus re-presentations in books, which are technically prints, are also “drawings.” If, on the other hand, we assume that the works in the portfolio were real drawings, a possibility suggested to me by G. E. Bentley, Jr., then we must also assume that this collection was sold by 1835 and replaced by a new collection focused entirely on Blake’s books, since the “one hundred and sixty designs” can be accounted for in full by illuminated books. It is more reasonable to assume that D’Israeli had a rudimentary collection by 1824 which he later enlarged. The works described seem to be Europe, Thel, and Marriage, and perhaps a separate plate, copies of which begin page 55 | ↑ back to top D’Israeli owned by 1835. Speculative as this is, it is probable that the “Blakean portfeuille” contained multiple titles, but not a copy of Songs, which Dibdin would have recognized and presumably expounded upon in more detail since he owned a copy of Innocence. The 1824 portfolio, then, may have contained 54 designs. Had D’Israeli purchased his copies of Urizen (B), America (A), Visions (F), and Songs (A) from the Romney sale (through the print dealers Evans and Tiffin), he would have added 106 plates to the collection for a total of 160 plates. With 54 plates, D’Israeli’s “Blakean portefeuille” was certainly not “the largest collection of any individual of the very extraordinary drawings of Mr. Blake”—nor would it have been had it contained all “160 designs.” In 1824, Thomas Edwards, the brother of publisher Richard Edwards, owned the 537 large drawings of Night Thoughts, which he had offered for sale in 1821 for £300, and again in 1826 and 1828 for £50 (BB 646). Butts’ collection contained more illuminated prints and water color drawings than any other collector or patron (as opposed to publisher). Flaxman’s, with Songs copy O, Innocence copy D, and 116 designs for Gray’s Poems, was larger, as were Linnell’s and Cumberland’s illuminated book collections.23↤ 23 In addition to The Book of Job and other drawings, Linnell owned Innocence copy I, America copy O, Europe copy K, Marriage copy H, Songs copy R, Jerusalem copy C, and On Homer’s Poetry copies B and C (250 designs on 224 leaves), and had three copies of For the Sexes. In 1824, Cumberland’s illuminated book collection probably consisted of America copy F, Visions copy B, Europe copy C, Song of Los copy D, Thel copy A, Songs copy F, and For Children copy C (115 designs on 102 leaves), and possibly Marriage copy A and Urizen copy F, since they were once bound with Thel copy A (Census 21). Bentley, though, believes they were bound by Beckford, who owned them by 1835, since they were not listed in the 1835 Cumberland auction catalogue. Lot 61 of that catalogue was “Blake’s Book of Job. Book of Thel, etc. coloured; and Gates of Paradise,” and sold for £3.13s.6d. (BB 657). The “etc.,” though, is inconclusive; if only these three works sold, the price was high, especially compared to lot 60, which consisted of copies of America, Visions, Europe, and Song of Los bound together, and The Grave, and sold for £3.18s. Keynes’s attribution of Marriage copy A and Urizen copy F to Cumberland should not be easily ruled out. In 1835, Butts bought America, Visions, Europe, and Los from the Cumberland auction and added them to the illuminated books he already owned: Songs copy E, Thel copy E, Ghost of Abel copy A, Jerusalem copy I (posthumous), Milton copy A or B, On Homer’s Poetry (?A), which by any counting made his the largest collection of illuminated books and prints at that time. It is interesting that Butts, who was a major collector of water colors and drawings and had purchased a few books, acquired most of his illuminated books from another collector and not directly from Blake. It was “curious” not only for D’Israeli not to have mentioned Blake in any of his writings (or for Blake, or any of Blake’s friends, not to have mentioned D’Israeli as a patron), but also for Dibdin not to have mentioned Linnell, Cumberland, Butts, Humphry, Edwards, Thomas, or Hanrott, Blake’s major patrons and collectors at that time, in either his Library Companion (1824) or Reminiscences (1836). Dibdin’s comments regarding the size of D’Israeli’s collection of 1824 are clearly those of a man with very limited knowledge of Blake’s friends and collectors, and, as will become evident, of the size and diversity of Blake’s canon. This is not surprising; according to the DNB, Dibdin’s reader “will find a great deal of gossip about books and printers, about book collectors and sales by auction; but for accurate information of any kind he will seek in vain.”24↤ 24 The DNB also quotes the even harsher critique of Alexander Dyce: Dibdin was “an ignorant pretender, without the learning of a schoolboy, who published a quantity of books swarming with errors. . . .” Even a defender of Dibdin’s like William Alexander Jackson was forced to admit that “the person who turns to Dibdin for information finds a . . . baffling kind of error—and sometimes it entails considerable search to ascertain whether or not Dibdin is confused or careless, or whether he really had seen such a book as he describes” (Records). Dibdin may have compared D’Israeli’s collection to his own, which by the time of his death (1847) consisted of Thel copy J, Visions copy G, and unknown copies of Night Thoughts and Innocence. The 43-plate Night Thoughts, which was one of Dibdin’s favorite books, was acquired by 1836, but not necessarily before 1824. Dibdin’s copy of Innocence was acquired by 1816, the year that Blake paid him a visit. Though the specific copy is unknown, I suspect that it was an early one, because it appears to have been purchased secondhand: “I told Mr. Blake that our common friend, Mr. Masquerier, had induced me to purchase his ‘Songs of Innocence,’ and that I had no disposition to ‘repent my bargain’ ” (Reminiscences 2: 787; BR 243).25↤ 25 Masquerier was a respected painter 20 years Blake’s junior. He was also a friend of Crabb Robinson’s, who speaks of him as having no feel for or appreciation of Blake (BR 331, 336, 549). Dibdin telling Blake that he owned an illuminated book suggests that he did not purchase the book directly from Blake. But even if he had, and the “bargain” was the good price given to him by Blake, that too suggests an early copy, one that Blake did not specially print for Dibdin but was “in hand.”26↤ 26 Blake sold many books late in life that were printed early, that is, sold them from stock. Examples of this practice include Innocence copy I, which remained in the studio till Linnell purchased it (Essick, Huntington Catalogue 146); Songs copy J to Tulk; Songs copy R to Linnell; Songs copy E, which contained impressions from Innocence copy J, to Butts; Innocence of Songs copy O to Flaxman; Marriage copy H to Linnell; and America copy D to Crabb Robinson. Dibdin may have owned Innocence copy S (BB 410), but this is sheer speculation, apparently based on copy S being watermarked 1808 and thus appearing to be the copy printed closest in date to Blake and Dibdin’s 1816 interview (BR 242-43). But as Bentley also points out, Dibdin’s copy could have been G, J, L, N, O, Q, or T; in short, any of those whose early nineteenth-century history is unknown (BB 410). That it was an early copy, like G, J, or L, means it was printed octavo on both sides of the leaves, that is, 28 to 31 plates on 15 to 17 leaves. As mentioned, Dibdin’s copies of Thel and Visions were bound together, possibly around 1816, but not necessarily for Dibdin; they could have been purchased after 1824, or even after 1836 (see n. 16). Indeed, if D’Israeli’s collection was large relative to Dibdin’s, then it is likely that Dibdin’s copies of Thel and Visions were not yet in his collection in 1824, since they would have increased the size of his collection to 47 or 50 designs on 34 or 36 octavo, quarto, and folio leaves—too many to exaggerate the size of his friend’s collection as the “largest.” On the other hand, a portfolio consisting of Marriage copy D, Thel copy F, Europe copy A, and a separate plate, that is, 54 variously sized and colored images printed on one side of large folio leaves, would not only have appeared to consist of drawings instead of either prints or book pages, but, relative to Dibdin’s Innocence, would also have appeared particularly extensive and beautiful. Eleven years later, in 1835, Dibdin requested the loan of the portfolio because he intended to include Blake in a projected chapter on the fine arts in his Reminiscences. D’Israeli’s “reply,” however, “not only staggered me, but induced me to abandon nearly my whole intention in regard to Blake” (BR 243). Dibdin was “staggered” by the sheer number of designs in D’Israeli’s collection, which he (or D’Israeli) emphasized by printing it in small capitals: “ONE HUNDRED AND SIXTY.”27↤ 27 I have not seen the original letter, and I suspect Ogden did not either. Though Ogden, observing that “Dibdin’s text of the letter is patently corrupt,” “emended its obvious errors,” such as “every” for “very,” a semicolon for a period, and “teribil via” for “terribilita,” he leaves “one hundred sixty” in small capitals (44n). This makes it unclear if the emphasis is in the original or in the transcript (which he uses), the former expressing the excitement of news, the latter expressing Dibdin’s own initial response. In either event, however, it seems clear that Dibdin was “staggered” by the size of a collection he thought he knew. Again, it appears that Dibdin acquired Visions copy G with Thel copy J, with which it was bound, not from the 1834 auction but from an unknown collector after writing the Reminiscences (1836), for how with these two books in a collection consisting of Innocence and Night Thoughts could he record having been staggered by the size and diversity of Blake’s canon? If anything, it seems that his interest in Blake was reawakened by D’Israeli’s enlarged portfolio. He was, no doubt, induced to abandon his intention by the unexpectedly large number of works to be examined, and by D’Israeli’s warning that “it was quite . . . impossible, if you had them, to convey a very precise idea of such an infinite variety of these wonderous begin page 56 | ↑ back to top deleriums of [Blake’s] fine and wild creative imagination” (243-44). Clearly, Blake’s canon was larger and more diverse than Dibdin realized, than his own collection at this time would have led him to believe, and D’Israeli’s collection had grown substantially since the last time they spoke—and certainly since the last time he had seen it. D’Israeli says as much, telling Dibdin in the same letter that there were “unimaginable chimeras, such as you have never viewed . . .” (BR 244). I suggest that D’Israeli’s collection grew by 106 prints, or four volumes: Urizen copy B, Visions copy F, America copy A, and the two volumes D’Israeli was eventually to bind as one, Songs copy A. These are the books, and appear to be the copies, first owned by Romney. D’Israeli’s interest in the illuminated books appears to have been primarily pictorial rather than literary. His bias reveals itself not only in his description, which carefully attends to the visual images and drawing and coloring styles, but also in his comment about the poetry: “the verses . . . are often remarkable for their sweetness and their depth of feeling” (BR 244). He seems to have read nothing other than the Songs—lending further credence to Gilchrist’s belief that Blake’s poems were “to the multitude . . . unintelligible” (Gilchrist 1: 303). What is not clear is the relation D’Israeli had with Blake. Ogden, echoing Keynes and Bindman, expresses the general consensus that “apart from Blake’s few close friends, D’Israeli seems to have been the earliest customer for the illuminated books” (43) and “one of the first to discern his Genius” (207). Admittedly, collecting Blake’s illuminated books seems especially appropriate for a man of letters who wrote the very popular Curiosities of Literature (1791-1834) and whose most original work was An Essay on the Literary Character (1795), a discourse on original genius. But there is no documentary evidence I know of to prove that D’Israeli knew Blake personally, or was responsible for the commission, or even had purchased illuminated books in the mid 1790s, when the books in his collection were produced. Though in 1799 he was a member of the Society for the Encouragement of Arts, Manufactures, and Commerce, through which he met James Barry, D’Israeli and Blake moved in very different circles. Through Murray, his publisher, D’Israeli met many of the “leading contemporary men of letters” (Ogden 1), including Scott, Byron, and Southey, but “there is not enough evidence to connect him closely with any of the group that met at Joseph Johnson’s bookshop” (Ogden 43). The only reasons to suggest he may have known Johnson are his friendship with Godwin in the 1820s and, again, his collection of Blakes, for it would have been at Johnson’s “that he would be most likely to get to know the work of Blake, if not the artist himself” (Ogden 43). But Tyson’s biography of Johnson does not mention D’Israeli at all. And, had D’Israeli frequented the shop, he would probably have seen book illustrations, not illuminated books. It does, indeed, appear that the sole evidence for supposing that D’Israeli knew Blake is that he owned Blakes.28↤ 28 Their paths may have crossed very early, though without either of them being aware of it, and before the invention of illuminated books. D’Israeli had contributed “Letter from Nonsense with some account of himself and family,” and “Farther account of the family of Nonsense,” to Holcroft’s Wit’s Magazine for April (145-47) and May (177-79) 1784, which also contained plates engraved by Blake. Given the absence of hard evidence to the contrary, it seems reasonable to suppose that D’Israeli may have purchased his illuminated books late and possibly through others. As mentioned, his copy of Marriage (D) was produced early but was stabbed by Blake in a peculiar style (six stab holes) that he used only one other time, and that after 1815. Like many other illuminated books, including Dibdin’s copy of Innocence, Marriage copy D appears to have been produced early but sold late. That Dibdin came to own illuminated books, purchased possibly from dealers or collectors and not from Blake, but certainly purchased many years after they were produced, that Songs copy D was sold at auction in 1813 (BB 413), that Rivington and Cochran offered Songs copy U in 1824 (BB 654), that Hanrott bought Songs copy P from an auction in 1826 (BB 419), and that Francis Douce, D’Israeli’s closest friend, purchased Marriage copy B from Dyer in 1821, all suggest that illuminated books were beginning to change hands late in Blake’s life without his involvement.29↤ 29 Bentley has not identified Dyer, other than to suggest “(George?) Dyer,” by which he probably means the poet (1755-1841) (BB 289, 298). Perhaps “Dyer” was the “honest, worthy, painstaking bookseller, the brother of the late Rev. Mr. Dwyer,” whom Dibdin mentions in Reminiscences (1: 194), or, as Essick has suggested, Charles George Dyer, a London printseller (Separate Plates 30). Blake selling early books late, and other people selling Blakes during his lifetime, reinforce the possibility that D’Israeli acquired his 1824 “Blakean portefeuille” without having met Blake personally, or at least not early. Dibdin’s 1824 reference to D’Israeli’s collection as the largest cannot be taken seriously, nor should the idea that D’Israeli was an early purchaser and patron. D’Israeli was, along with Cumberland, Humphry, and Butts, a major Blake collector, but like Hanrott, Linnell, and Vine, he appears to have begun collecting Blake late. D’Israeli may have learned of Blake through Dibdin or Francis Douce, friends who owned illuminated books by 1821, or Prince Hoare, a friend who knew Blake well. Or, he may have learned of Romney’s specific copies of Blake’s books through his friendship with the dramatist begin page 57 | ↑ back to top Richard Cumberland, who was also a close friend of Romney’s. 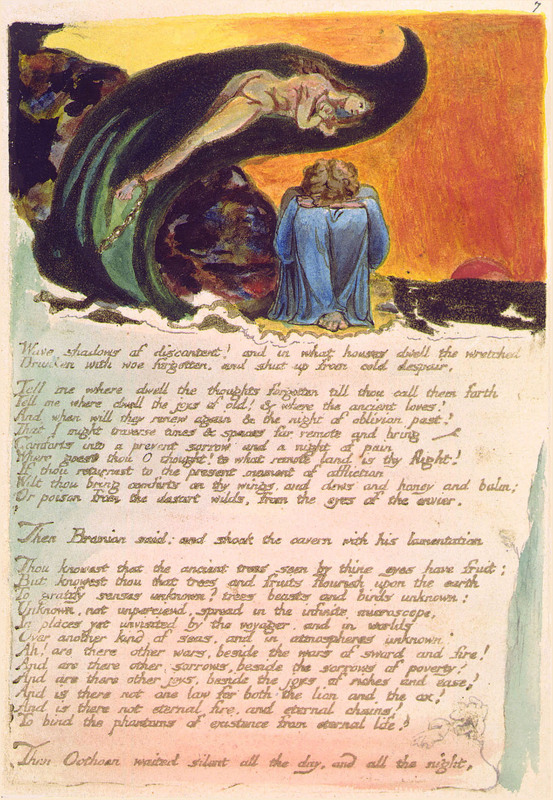 However he learned of Blake, by 1835 D’Israeli’s collection of illuminated books, while not the largest, was one of the most comprehensive, coherent, and impressive “of any individual.” It appears, though, to have been formed in large part by a previously unrecognized Blake collector who was also a patron, George Romney. Did Romney form his collection the same way, purchasing a group of books, or one book at a time? More important, were the works he purchased commissioned by him or purchased from stock? These questions can be answered only by answering another: when were the books produced? Romney’s and D’Israeli’s books constitute a set not merely by ownership but by sharing stylistic features rare or unique for most of the books. As noted, the usually monochrome America is colored; the usually octavo Songs is folio and in two volumes; the normally colorprinted quarto Urizen is folio and not printed in colors; the usually quarto Thel and Marriage are folio and printed in two colors, and the usually color-printed Europe is not color printed. To this list of books can be added Visions copy G, which is, as noted, closer stylistically and materially to these large paper copies than is colorprinted Visions copy F, the copy that appears to have sold as lot 79 in the Romney auction of 1834. Visions copy G was printed without borders on one side of the sheet and, like Romney’s and D’Israeli’s copies, was numbered in ink. It was also printed in a brownish-black ink similar to the one used in America copy A and Urizen copy B, and exactly that of Europe copy H, a monochrome copy which appears to have been printed along with Europe copy A, D’Israeli’s copy, as monochrome copy B of America was printed with America copy A, and Songs copy R appears to have been printed with Songs copy A.30↤ 30 The similarity between Europe copies A and H has been noted by Bentley: “Copy A, which is much like H, may have been printed early, but it seems to have been colored later, for both the designs and the text are colored, a practice Blake apparently began about 1805” (Europe 5). Bentley’s date for coloring is based on his theory that washed texts were characteristic of post-1805 coloring (see n. 10). Bindman, though, believes its coloring belongs “to the mid-1790s” (Art and Times 106), Which is technically more likely than its printing and coloring having been separated by years. Europe copy H is on smaller leaves than Europe copy A and is not listed in Blake Books (142) as trimmed, but “the leaves were disbound, trimmed, and individually mounted, probably on the instructions of E. W. Hooper for the 1891 Boston exhibition” (Europe 14). Initially, the paper for the two copies may have been the same size, though in copy H it was undated E & P, the kind used in many of the recto-verso folio copies of America and Visions which appear to have been printed c. 1793-94, and in Marriage copy F, which was color printed c. 1794-95. The paper, in other words, appears to have been from earlier stock than that used in Europe copy A and the other large paper copies. The brownish-black ink of Europe copy H is the same as in Visions copy G and appears to be the same used in Europe copy A, which is not an olive brown (BB 142), but a brownish-black. Europe copy H may have been left monochrome to match America copy B, as Europe copy A appears to have been colored to match America copy A. The proposal that at least a second set of impressions were printed from the plates is in keeping with standard printing practice. With materials made and equipment set up, it would have been extremely inefficient not to have done so (see n. 41). It is possible, then, that untraced Visions copy Q, which was printed on one side of the leaf, may have been printed along with Visions copy G, that is, the second set of Visions impressions pulled in this printing session. All Religions are One copy A and There is No Natural Religion copy L also appear to have been produced during this printing session. They are the only copies of these books printed on folio-size leaves, which given their one or so inch images strongly indicates that they were intended to match other copies of illuminated books. Several other features also support the idea that they were intended to be part of the set: they have the same ink as one another, the same printing style and paper as the other large paper copies, and the rudimentary color printing of Thel copy F and Marriage copy D.31↤ 31 In all four copies, relief lines and areas were brushed over with a second ink, black in Marriage and Thel, and brown in All Religions and No Natural Religion. The second ink was used to create shading and texture, which is most apparent in the treatment of bark on the trees of Marriage plate 2, Thel plate 1, and No Natural Religion plates b10 and a5 of copies L and C, and the frontispiece of All Religions (see n. 32). These copies of All Religions and No Natural Religion were printed on I. Taylor paper, the former dated 1794 and the size of the leaves used in the D’Israeli copies, the latter undated and trimmed to approximately 30 × 22 cm as part of a volume of miscellaneous Blake prints (BB 337-39). 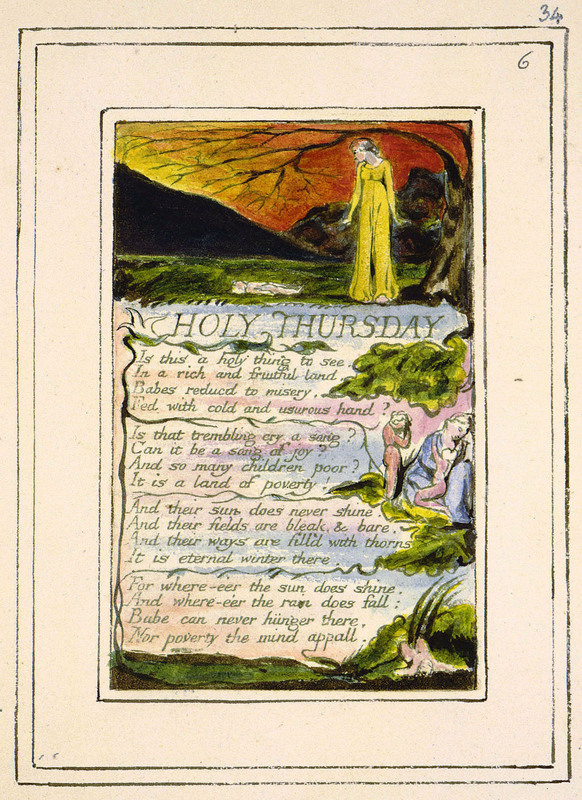 The leaf size, the four frame lines given each image (which may have been added late, as were those in Songs copy R), the absence of other copies, and its being kept in the studio until it was acquired by Linnell, suggest that All Religions are One copy A, the only complete copy extant, had a special importance to Blake. The same appears true of No Natural Religion copy L, which is on large leaves, with each image given four or more frame lines and finished in pen and ink. It is also the only complete copy of series b, and appears certainly to have been printed with 12 other green impressions now in copies C, D, and L2. All the other impressions of No Natural Religion, series a and b, were printed in brown, yellow-ochre, or olive, though most are listed simply as “brown” and on octavo-size leaves (BB 80-81). Their “general uniformity suggests that they were printed at the same time” (BB 82), while their distinct differences from the green impressions suggests that they were printed in a different session. Blake, it appears, printed at least one copy of each illuminated book in this large paper, recto-only format, which is to say, during one session he printed his entire canon up to 1795 in a uniform style. The copies printed were All Religions copy A, No Natural Religion copy L, Thel copy F, Marriage copy D, Visions copy G, Urizen copy B, America copies A and B, Europe copies A and H, and Songs copies A and possibly R. The hypothesis that these 11 copies belong to the same printing session is suggested not only by their stylistic similarities, but also, and more importantly, by their material similarities. With the exception of Europe copy H, all were printed on I. Taylor or J. Whatman paper (either undated or dated 1794) approximately 37 × 26 cm, and in the same colors, which were possibly the same inks. As noted, America copies A and B and Urizen copy B were printed in the same light brownish-black ink; Europe copies A and H and Visions copy G were printed in the same light brownish-black ink, possibly a lighter hue of the ink used in the copies of America and Urizen. A similar light black ink was used in illustrations of Marriage copy D and Thel copy F, making both books, technically speaking, color printed, since their texts were printed in green and yellow-ochre, respectively.32↤ 32 Marriage copy D is said to be in green and brown inks (BB 287n4); the brown is actually black, which is the same hue, and possibly the same ink, as that used in Thel copy F. In Marriage it was brushed over the green and used to create shadows in plates 1-5, 10-11, 14-16, 20, 21, 24, and in Thel it was brushed over the yellow-ochre in plates 1, 6-8. This brownish-black reticulates like an ink, and not like a tempera color. (The very dark and solid black that often passes for color printing is an opaque tempera that was applied to the impression.) It is possibly the black ink used to print America copies A and B and Urizen copy B. In any event, the color printing in Thel copy F and Marriage copy D is rudimentary, coming from the relief areas and not the shallows, as it did in Visions copy F and most other works color printed on one side of the leaf. The green of Marriage copy D varies from light to bluish to viridian lake, but the greener hue is very similar, if not the same, as the hue used in Songs copy A (Experience), All Religions copy A, and No Natural Religion copy L.
Light black, brown, and various greens, along with the yellow-ochre of Thel copy F, make for four distinct printing inks and may seem to invalidate my suggestion that the shared materials and stylistic features are signs of the same printing session. But Blake had used more inks than this in Marriage copy B, which was printed in yellow-ochre, olive-green, sage-green, dark grayishbrown, and reddish-brown (the last color used consistently for facing pages, which indicates that the 27 plates were printed at the same time), and, of course, he had prepared as many colors and inks for the copies of books that he color printed from both the shallows and relief areas, like Visions copy F, or Urizen copies A and C, or Marriage copies E and F. In short, different inks (like different papers), especially among copies of the same book, do not mean different printing sessions. 6. The Marriage of Heaven and Hell copy D, plate 10 Courtesy of the Lessing J. Rosenwald Collection, Library of Congress, Washington D.C.
7. The Book of Thel copy F, plate 7 Courtesy of the Lessing J. Rosenwald Collection, Library of Congress, Washington D.C.
9. The Book of Thel copy H, plate 7 Courtesy of the Lessing J. Rosenwald Collection, Library of Congress, Washington D.C.
15 of the latter. Consistency in hue of a mixed color as opposed to a pure yellow, green, viridian lake, etc., suggests the sharing of that color, which in turn suggests that the two books were colored near in time to one another. 11. Europe a Prophecy copy A, plate 5 Courtesy of Mr. and Mrs. Paul Mellon, Upperville, VA.
blue, a green that varies from yellow to olive in its modeling, and an opaquish-pink. More important, the manner in which the colors were applied is also similar: broad washes with many smaller washes laid over to deepen the colors, as opposed to single, even tints.35↤ 35 As noted by Bindman, the coloring of Europe seems “in fact . . . to belong to the mid-1790s” (Art and Times 106) and not “about 1805” as Bentley claims (BB 147). It is stylistically closer to Urizen copy B than America copy A; the texts of Europe copy A are not washed and the coloring is not as heavy. Many of the figures, though, were deepened with a second wash in the same hue or in another color; the wings of angels (plates 6 and 8) are multi-colored in the manner of the snake in Urizen copy B, plate 24: pink, blue, yellow, green. A few plates in these copies (most notably the frontispiece of Visions copy G [illus. 12]) were stippled with a dry brush, a technique more characteristic of color-printed copies of Urizen, like copies C and F. Bindman has also commented on the peculiar coloring of Europe copy A: “bold additions in opaque watercolour that may have been touched up by another hand” (Art and Times 106). This appears true only of plate 1. Bindman also describes Europe copy A as color printed, though only plates 1 and 4 were printed in this style and even then only in a rudimentary manner. This technique is also used in Visions copy G, extensively in plates 1 (illus. 12), 2-3. The palette of Urizen copy B, though lighter, is similar to these other copies, even containing the deep pink-red and blue of America copy A and Europe copy A. The flames in Urizen plate 11 (illus. 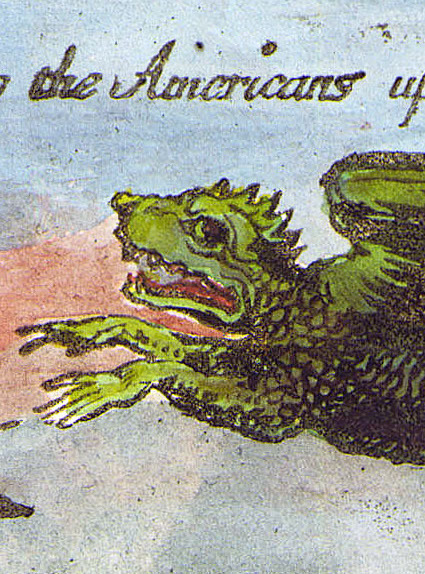 13), for example, are very like the flames in America plate 7 (illus. 10), with the same yellows, reds, and blacks; but more important, the flames are depicted in the same manner, again in multiple overlaid colors, in contrast with the earlier method of depicting flames in one or two flat colors, as in Marriage copies A-C, for example.36↤ 36 The similarity in palette is especially apparent between Urizen (B) plate 10 and America (A) plate 8; Urizen plate 24 and America plates 4 and 5; Urizen plate 18 and America plate 12; and Urizen plate 25 and America plate 7 in the coloring of the bodies. While Urizen copy B is closer stylistically to Europe copy A than to America copy A, its figures, especially the 10 full-plate illustrations, appear to have been painted more carefully than the larger works. of the same plate (a green instead of a pink dress, a blue instead of a purple sky, etc. ); what they fail to recognize and address, though, is how variants imply repeatable patterns, or similarity, and that the differences are in the placement of colors and not in the number or choice of colors, nor in the technique of applying them. Repetition of such specific stylistic features and techniques is a sign of edition printing and coloring. Here we need only to recognize that similarity or repetition across titles suggests that the books were intentionally produced as a set, and not simply as large paper copies printed along with other copies of the title, or printed according to a new model for the books, since too many of the qualities, like ink color and printing format, are unique.37↤ 37 If these were large paper copies printed with other copies of the title, then Innocence of Songs copy A would probably have been printed recto-verso or at the very least have included plates 34-36, which were, however, printed as Experience plates. This dates the printing of the plates after Experience of Songs copies B-E. See n. 43. The very existence of these copies, approached from a practical and commercial perspective, raises the question of motivation: why reprint Thel and Marriage folio size, or Visions on one side of the sheet, if not to match other large paper copies, since there appear to have been copies of all of them “in hand” between 1795-99? The obvious answer, that Blake produced them by commission and “with a particular customer in mind” (Erdman, Poetry and Prose 786), becomes less convincing when we raise the questions such an answer demands. If all 11 large paper copies were produced at the same time, and the seven copies Romney and D’Israeli owned were colored as a coherent set within a set, why then did Romney own only three (America copy begin page 62 | ↑ back to top A, Urizen copy B, and Songs copy A)? Why did he own Visions copy F, the color-printed copy, and not Visions copy G? And how did D’Israeli acquire three books from the set by 1824? Perhaps we will discover an intermediate owner for the three books, or evidence to show that Romney did own them all but that he or his son sold three of them, either to D’Israeli directly, or to a mutual friend, like Richard Cumberland. Or perhaps Romney simply preferred the ones he bought over the ones he did not, which is to say, perhaps he had a choice in the matter and bought the works from stock. The set was undeniably a special production, but that does not necessarily mean that it was motivated by a commission (or even that it evolved out of the commission of one or more of its copies); it may have been motivated by Blake’s desire to make either impressive gifts for friends, or, more likely, a deluxe set of his illuminated canon up to that time. Whether these books were commissioned or merely purchased from stock can be determined only by ascertaining their dates of production. Those can be ascertained only by establishing through the historical and technical records a chronology of production in the 1790s. Romney’s books must have been produced between 1794 and 1799, the date of the paper and of Romney’s departure from London. Circumstantial evidence suggests the even narrower parameters of 1794 and 1796, when two close friends purchased illuminated books. Ozias Humphry commissioned the Large Book of Designs and the Small Book of Designs copies A probably in 1796, the date inscribed on a plate in the Small Book of Designs copy B, which consists of impressions from the same printing sessions as those in copies A (BB 356n1).38↤ 38 Bindman and Butlin date the Small Book of Designs copy A (and by association the Large Book copy A) 1794 because the date on Urizen plate 1 was left as printed, i.e., “1794.” They date copy B 1796 because the printed date was altered in pen to “1796” (Bindman, Graphic Works 476; Butlin, Paintings and Drawings 2: 136). Given these dates, Bindman believes the two copies represent different projects and motives, the former serving as a “sampler of his best designs” to “demonstrate his colour-printing process,” the latter possibly “some kind of emblem book [compiled] out of a selection of his own designs” (476). A printed date, however, does not date a printing session, as is clear from nearly any reprinted illuminated book; America copies A and B, for example, retain their printed date of 1793 despite their having been assuredly printed later. The altered date is reliable for both sets because many of the impressions making up copies A and B were printed sequentially, as is self-evident in color reproductions in Butlin’s Paintings and Drawings and Essick’s Separate Plates. The two pulls of “Albion Rose” from the Large Book copies A and B, for example (Butlin, Paintings and Drawings illus. 331 and 332), have the same palette, color placement, and brushwork, which are material and stylistic features independent of the plate image and which could not have been duplicated months or years apart. The same is true of “The Accusers of Theft Adultery Murder,” “A Dream of Thiralatha,” and “Joseph of Arimathea Preaching to the Britons” (see Essick, Separate Plates, color plates 2-5, and 7-8). And the same is true of the impressions in the two copies of the Small Book of Designs. The three impressions of Urizen plate 5 in copies A and B (Butlin, Paintings and Drawings illus. 329, 357) and an independent pull (illus. 380) reveal the same kind of repetition (cf. 329, which is reproduced in color, with no. V in Bindman’s Art and Times, a color reproduction of Butlin, Paintings and Drawings illus. 357). Color-printed impressions pulled from the same plate at different times do not show this kind of exact repetition. Compare, for example, the two copies of Visions plate 1 from the Large Book of Designs copies A and B (Butlin, Paintings and Drawings illus. 362 and 337), where the highlights at the right corner and at the waves are exactly the same, with that of copy F (363), which was printed a year or so earlier. The same kinds of repetition and difference are apparent in color-printed drawings printed in 1795 and those printed in 1805 (see n. 46 and Butlin, “Physicality”). Color-printed impressions are easily misdated, because the sequentiality of color prints is not always self-evident. In color printing, a second pull is often weaker than the first and must be touched up more extensively in water colors and pen and ink, which in turn disguises the material and stylistic features it may have initially shared with another impression. This is especially apparent with the second copies of the Large and Small Book of Designs. Their impressions were more carefully outlined in pen and ink and attentively finished in water colors (see Butlin, Paintings and Drawings illus. 337, 338, 353, and 360). They were also given multiple frame lines, a stylistic feature characteristic of late production and similar to those employed in Songs copy R and All Religions are One copy A, both of which were printed early (c. 1795) but also refinished and sold late, both to Linnell. Like these other works, the impressions constituting the Large and Small Book of Designs copies B appear to have remained with Blake; three of the former were acquired by Linnell, and one of the latter given to Tatham. These impressions, in other words, appear to have been reassembled and freshened up late, and the “1796” date written in pen and ink may have occurred at that time, many years after the impressions were printed. For that reason, the altered date is probably the more trustworthy record of the initial production. It is interesting to note that D’Israeli or his son acquired three separate impressions from the Large Book of Designs copy B, and that Humphry’s impressions appear to be the first and finer pulls (see Essick, Separate Plates VIII, IX, and X). The impressions of copy B, which admittedly may exist as a book only by analogy with copy A, appear not to have been presented as part of a set or portfolio, but as autonomous paintings. Even the impressions making up copy A may not have been intended as a book, since they were never bound as a set but instead inserted and bound at the back of Humphry’s copy of Europe. Humphry owned Songs copy H, Europe copy D, and America copy H, probably before the 1796 commission, since none of the plates in either Book duplicated what he already owned—despite the obvious suitability of America and Europe designs for such a project. Flaxman also purchased illuminated books before 1796. Within a few months of his return from Italy in the fall of 1794, he moved to No. 6, Buckingham Street, Fitzroy Square, which made him Romney’s neighbor (Chamberlain 196), and purchased one and possibly two illuminated books. “Early in 1795 Flaxman ‘Pd for. . . Blakes Book. . . 10[s]6’ ” (BR 569), which was probably for Innocence copy D, but conceivably for Experience of Songs copy O as well, since in the prospectus of just 15 or so months earlier the price for the two volumes was 10s. (K 209) and the latter work appears to have come with a combined titleplate (BB 397).39↤ 39 Flaxman also paid Blake four shillings in Oct. 1795 for “Blake’s Engravings” (BR 569), which may account for Experience, but if so, then Innocence would have by itself cost 10s.6d., or six shillings more than Experience, which is very unlikely since it was printed on both sides of the paper and thus involved fewer leaves. Perhaps the 10s.6d. refers to Innocence copy D and an untraced drawing or print. If any other of Flaxman’s payments to Blake can account for Experience, it is probably the £2.2s. of Oct. 1797 (BR 570); this, of course, does not necessarily mean that Experience was produced this late, particularly since by then Blake was busily at work with Night Thoughts and Gray’s Poems (Bindman, Blake as Artist 109). It does suggest, though, that the printing session responsible for this copy of Experience occurred between 1795 and 1797. I understand “early in 1795” to mean the first month or two of the year and, as will become clear, conclude that The Song of Los, Book of Ahania, and Book of Los, all dated 1795, were produced at that time as well, before Flaxman’s copy of Experience. But even if Flaxman’s Experience was produced as late as 1796 or 1797 instead of “early 1795,” and the 10s.6d. payment was charitable for one volume, or included a deposit for work to be done, this copy of Experience can still be used as an end date, since it was printed in a style distinctly different from his Innocence and from Romney’s books, as well as from books that were color printed—including those in 1795. Like Humphry’s illuminated books, Flaxman’s Innocence and Experience are too similar in printing and coloring styles to other copies of Innocence and Songs to have been specially produced by commission; they were all probably purchased from the “numerous great works . . . in hand” (K 208). Innocence was printed on both sides of undated octavo-size paper in yellow-ochre ink, as were copies C, E, F, and G. Flaxman’s copy of Experience is nearly identical in printing to Songs copies I, J, K, L, M, N, Innocence copies N and R, and Experience of Songs copy S; all were printed on one side of unmarked paper, printed in dark brown ink, and, most telling, printed with plate borders.40↤ 40 It is not true that only “posthumous copies uniformly show this dark rim while copies printed by the Blakes do not” (Bentley, William Blake’s Writings 1: xlix). 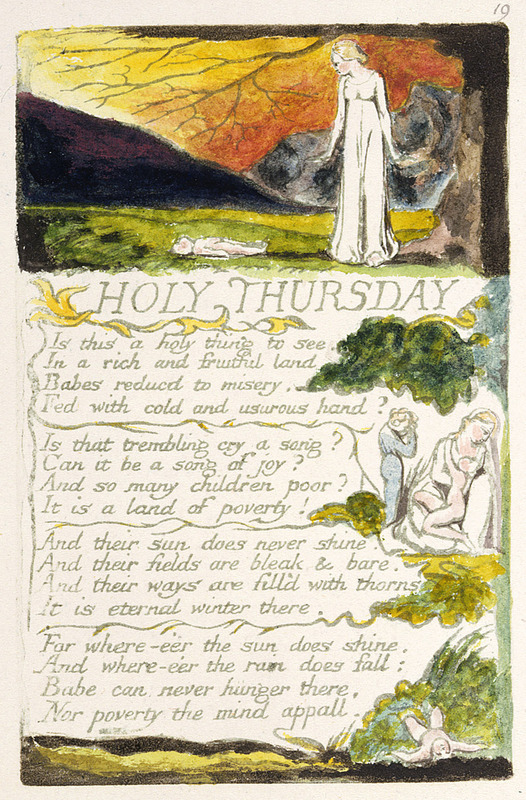 For plate borders, see the impressions from Songs copy I reproduced in The Illuminated Blake. 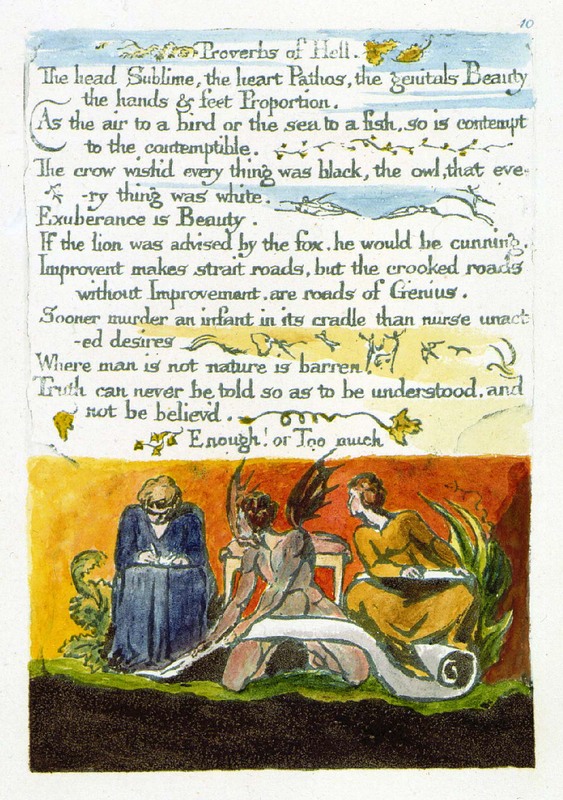 The borders in a few impressions printed lightly, not because they were wiped of ink, as was Blake’s earlier practice, but because they were avoided (i.e., incompletely inked) during inking. The ink varies in hue from lighter to darker brown, but it is the same ink. The variation is due to the thickness of the layer of ink as it is spread out and as it is applied to the plate, and even of slight differences in the thickness and dampness of paper, since the condition of the paper affects pressure and receptivity. Innocence copy W, which is untraced, was probably part of this edition. The rudimentary description in Sotheby’s auction catalogue for 30 April 1941 (lot 641) strongly suggests this possibility: “22 plates printed in brown on one side of the paper only, watermarked ‘Whatman’ on plate 18, wrappers, loose in morocco binding (715/16 in × 49/16 in).” An otherwise irregular pattern of production (seven sets of Innocence and eight of Experience) also suggests that Innocence copy W was part of the edition. Plate borders were wiped in all recto-verso copies of illuminated books, including Flaxman’s Innocence. They were also wiped in books color printed and in Romney’s and D’Israeli’s books, all of which were printed on one side of the leaf. These copies, whether printed on one or both sides of the leaf, were given more individual attention than copies where the borders were left intact. Conversely, plates not wiped of their borders were easier to ink and faster to print, making the book easier to produce. The copies of Songs and Innocence with which Flaxman’s copy of Experience appears to have been printed are dated 1800-1814 (BB 382); they are assumed to have been produced one at a time because the coloring is different from copy to copy and some copies were left uncolored (Songs copies K, M, and Innocence of Songs copy O). But a comparative examination of these copies (particularly of the inking accidentals shared by impressions from the same plate) reveals that they were printed at the same time, in a limited edition. Such an examination also shows that the coloring is not really very different, that the coloring of Flaxman’s Experience “strikingly complements Innocence copy N” (BB 419), as well as Songs copies I and L. These copies have similar palettes and their texts were similarly streaked in multiple colors (pink, yellow, and blue), instead of washed begin page 63 | ↑ back to top solidly in one or two colors. Such similarity is not accidental nor the result of one copy being used as the model for others produced years later; it is the inevitable result of copies being produced at the same time and with the same materials.41↤ 41 Besides sharing stylistic features like format, size, and ink, these copies share accidentals in inking (filled counters, blemishes from shallows, missing letters, etc.). “The Lamb” of Innocence copy N, for example, shares inking patterns, such as the same words darker and lighter, with “The Lamb” of Songs copy O. “On Another’s Sorrow” in Innocence copy N is the same as the impression in Innocence copy R, with the same letters missing and same letters strengthened. These are signs of edition printing and cannot be repeated by printing copies over a few years, matching them to an unstated but presumed archetype. An even more overt sign of edition printing is the exact repetition of recto-verso plate pairs in Innocence copies A-G, K-M, and Innocence of Songs copies B-E, which are thought to have been produced between 1789 and 1800 (BB 376-77, 382). Bentley says “there is no easy explanation for why” the same two plates would be “invariably paired” (BB 387). The difficulty dissolves once the unstated assumption that illuminated books were printed one at a time and by commission is dismissed. Indeed, if illuminated impressions were printed per book and not per plate as was standard practice, then the exact repetition among copies supposedly produced over an 11 year period necessarily implies a model, an idea especially difficult to accept for Innocence and Songs. It means that Blake would have intentionally repeated himself only to undermine the model’s pairing by ordering the pages differently in each copy, while within the same period producing copies of Innocence (copies I, J, X, and Innocence of Songs copy F) that do not repeat the model. While traces of ink from the lower shallows may continue to print, their absence within a set of impressions is no more proof of discontinuous printing than are different inks or sizes of paper, but may be a sign of the cleaner impression having been pulled first, or of necessary adjustments in ink, dabber, pressure, etc., having been made to make the next print better. Indeed, the very existence of poorly printed or registered illuminated impressions is reason enough to believe that Blake printed multiple impressions per plate—and to have done otherwise would have been a terribly inefficient use of time, labor, and materials. He admits as much in the prospectus: “No Subscriptions for the numerous great works now in hand are asked, for none are wanted; but the Author will produce his works, and offer them to sale at a fair price” (K 208). Blake declares that multiple copies of each book had been and would continue to be produced independent of subscription, that he had, in other words, produced books on his own account and independent of advanced monies. The idea that Blake printed most of the illuminated books in limited editions and not one at a time, printed the impressions per plate and not, as Essick (and others) argue, on “a per-copy basis” (Essick, “Materials” 856), alters the dates of most books and our understanding of what constitutes Blake’s “style,” as well as our idea of what motivated production. Perhaps more significant, it is a mode of production that reveals when Blake was and was not involved with poetry, which forces us to reexamine the role illuminated printing and poetry played in Blake’s creative life after 1795. The evidence for this mode of production is dealt with briefly in my Art of William Blake’s Illuminated Prints and more extensively in a forthcoming article. Printing the plate borders made it necessary to color the impressions more extensively, since text and illustration were now framed and would have looked unfinished if the washes did not meet the border/frame. This is why washing and streaking the text became common practice in books printed after 1795. Conversely, washed texts in copies without borders like Romney’s America copy A, or the streaking in Thel copy F, Marriage copy D, and Visions copy G, may have preceded and prompted the printing of the borders. It appears that Blake had decided to color most of these copies of Songs as part of the initial production process, as was his usual practice, but kept a few copies back to color on order. How many of these uncolored impressions were later colored is not known, but the decision to print plate borders and leave some impressions uncolored or to color them upon need increased the potential for variation among copies initially printed at the same time. It was also the most cost-effective way to produce illuminated books, being a compromise position between “produc[ing] . . . works” without “subscription” and producing by commission (K 208).42↤ 42 Separating coloring from printing also gave Blake the option of offering monochrome copies as “finished,” that is, illuminated prints as prints instead of hand colored drawings, should that be requested of him. In any event, monochrome copies of Innocence and Songs are not “proof” copies, as Songs copy K is described by the Pierpont Morgan Library’s catalogue. There are no “proof” copies of these works, since the point of proofing a plate was to check its design or to test and adjust the press. Neither case requires the whole set of plates be printed. The straightforward printing method represented by Flaxman’s copy of Experience (one ink, full plate, no wiping) became standard practice, succeeding the most expensive and laborious method, color printing. Color printing required multiple colors as well as special inking tools, and the resulting impressions usually required extensive recoloring and outlining. Without confirmed sales, the technique may have cost Blake more in time and materials than he could afford. Or, he might have abandoned it, if not for financial reasons, because in 1795 the creation myth expressed in the last four illuminated books had run its course, and his time, energy, and coloring technique were taken up by new, completely pictorial projects, like the 12 large monotypes, creating paintings by color printing earlier engravings, like Albion Rose, and starting the Night Thoughts designs (Butlin, Paintings and Drawings 1: 178). Color printing itself initiated printing on one side of the leaf, which replaced recto-verso printing, despite the four recto-verso color-printed copies of Europe copies D-G. These four copies, which were apparently printed together along with single-sided copies B and C, appear to have been intentionally printed to match recto-verso copies of America.43↤ 43 Europe copy F is not listed as being color printed (BB 142, 145), but all of its plates were color printed from the surface in the same manner and, more important, with the same colors and inks as copies D, E, and G, which suggests that the four copies were printed together. In plate 9, for example, the two women, child, and background are color printed in four different colors: green, reddish brown, yellow ochre, and black. In copies D-G, the same four colors are used, though their placement may alternate. The figure on the right is reddish brown in copies D, E, and G, and there are slight traces of that color in the hands of the figure in copy F, which is in yellow ochre. The very same inks and placement were used in plate 9 of copies B and C, except that the reddish brown of the right-hand figure was also printed from the shallows. It appears that Blake painted the plate six times using the same palette and printed four impressions on two sides of the sheet and two impressions on one side only. All six copies are on undated I. Taylor paper, with at least two sheets of 1794 / J. Whatman in copy C; the four recto-verso copies match recto-verso copies of America, or, rather, give buyers the opportunity to have matched copies, buyers such as Ozias Humphry who owned recto-verso copies of America (H) and Europe (D). At this time (c. 1794), though, there were only recto-verso copies of America; copies A and B, the single-sided colored and monochrome copies of America had not yet been printed. They were produced as part of the large paper set and appear to have had as their counterparts Europe copies A and H, which were similarly colored and uncolored. The Experience plates of Songs copies B-E, all on undated I. Taylor and J. Whatman papers, were probably printed recto-verso for the same reason as Europe copies D-G: to match copies of Innocence printed earlier. That the two parts were printed at different times is indicated by plates 34-36 having been printed with Innocence but moved over to Experience, taking with them plate 26 (the recto of pl. 34), which belongs to Innocence. The color printing, though, is minimal, with colors printed only from relief areas, whereas in copies B and C it is from the shallows as well. Printing colors from both levels of the plate requires more pressure and creates a more elaborate and painterly image—as well as a more pronounced platemark, which in turn eliminates the use of the verso.44↤ 44 Platemarks are most noticeable in Experience, Marriage, and Visions color-printed plates; given their embossments, these plates were apparently bitten deeper than Urizen and Song of Los. Todd’s assertion that color printing did not require a press is unfounded and ignores the fact that both levels are being printed and that the inks were burnt oil and not glue based like the colors. The former is the vehicle for intaglio ink and necessitates more pressure for its clean transference from plate to paper than can be gotten “by the hand” (Todd 37). Unlike Experience, and perhaps even Europe, Urizen seems to have been executed specifically to be color printed. Not only were all copies of Urizen printed in this new style—except copy B and late copy G—but the plates were exceedingly shallow (Essick, Printmaker 92), and thus most suitable for printing colors from both levels. For these reasons, I suspect that copies A, C-F, and J were printed first and before copy B. They were probably produced in 1794, the year the plates were executed, after Europe and Experience and possibly after a few copies of earlier books reprinted in the new technique, including Visions copies F and R and Marriage copies E and F. The following year Blake wrote and colorprinted copies of The Song of Los, Book of Los, and Book of Ahania, all on one side of the leaf. There is also an aesthetic reason for abandoning recto-verso printing. The increased labor required by color printing, both in the painting of the plates and subsequent coloring and outlining of the impressions, many of which would have otherwise looked like blots and blurs, resulted in more detailed and complicated images. Finishing of this kind, combined with the absence of a competitive facing page, creates an image that demands to be viewed and experienced more like a painting than a page in a book, more autonomously than as part of something larger than itself. The new printing format and coloring style reflect a new idea of the book and reader, or rather reading experience. Because the experience of an illuminated poem as physical book is as much an integral part of its meaning as the combination of word and picture, changes in the physical form alter how the poem is read and thus its meaning. There are only 17 extant impressions pulled from the small intaglio plates that make up The Book of Los and Book of Ahania; in terms of labor, these etchings and color-printed frontispieces and titlepages represent about a slow day’s worth of printing. The 48 or so colorprinted impressions pulled from the eight Songs of Los plates were printed in an edition, that is, the impressions were printed per plate and not per book.45↤ 45 For a description of copy F, which was recently rediscovered, and color reproductions, see Dörrbecker. A comparison of the ink color and inking peculiarities of plate 4, for example, reveals that the impressions from copies A-F were pulled sequentially; Essick notes the same with plates 1, of copies A-E, though finding a different printing order than myself (Essick, Printmaker 129). Other colorprinted works, like the Large Book of Designs copies A and B, the Small Book of Designs copies A and B, and the monoprints of 1795, followed this practice (see n. 38). All six (eight-page) copies could have easily been produced in two or at most three days. This may strike the non-printmaker as a herculean effort, but in fact the work involved, particularly begin page 64 | ↑ back to top for a professional printmaker with a printing “devil” (Mrs. Blake) handling the paper and press, was modest. Once the studio was set up for printing, the press prepared, inks and colors made, paper cut and dampened, the actual printing of the plates could not have taken very long. In fact, Blake would not have had much time to play with the plates, since in color printing some of his colors were water soluble and would have dried on the plate had he dawdled.46↤ 46 Color printing preceded and led to Blake’s great color print drawings of 1795, which are technically monotypes. 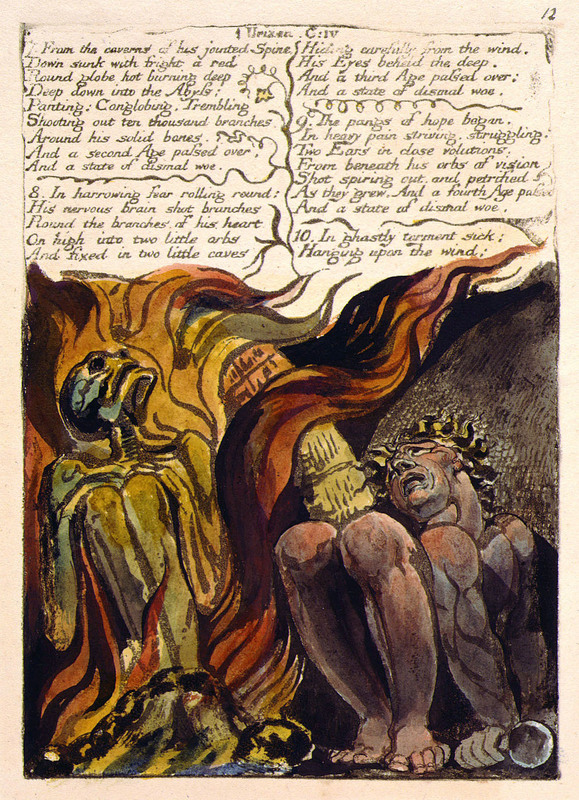 Tatham described Blake’s monoprinting process to Gilchrist as making “prints in oil,” and although the medium appears not to have been oil paint but a mixture of ink and size color, and the support appears not to have been exclusively millboard (at least one print, “God Judging Adam,” was pulled from a relief-etched metal plate), and although Linnell dismissed the account as inaccurate (without saying how or why), Tatham’s description is essentially correct for both the monotypes and the color-printed illuminated impressions. According to Tatham, Blake painted his colors upon the support: roughly and quickly, so that no colour would have time to dry. He then took a print of that on paper, and this impression he coloured up in water-colours, repainting his outline on the millboard when he wanted to take another print. This plan he had recourse to, because he could vary slightly each impression; and each having a sort of accidental look, he could branch out so as to make each one different. The accidental look they had was very enticing. (BR 33-34, my emphasis) Tatham admits that impressions could be sequential and different, though, as noted (37), the overt differences were due more to finishing than to printing. He also admits that impressions could be produced whenever Blake “wanted to” repaint “the outline,” which implies that multiple color-printed drawings could have been printed during one session or years later, which is exactly what recent research of Martin Butlin, the leading expert on the color-printed drawings, has verified, that some impressions were printed sequentially in 1795 and others from the same plates in c. 1805 (Butlin, “Physicality” 12). The fact that Blake was producing color prints in c. 1805, with all their blots, blurs, and opacity, indicates that color printing’s use and abandonment were not tied to Blake’s changing theories about perception. What Blake said of drawing was true of color printing: “That is not a line which doubts & Hesitates in the Midst of its Course” (K 603). This was even more true of executing the designs, which essentially was drawing, which is to say, the designs were not labored but drawn freehand, the materials of pen, brush, and varnish making such an autographic process possible—and necessary. Any hesitation would clog the pen with varnish and prevent a uniform script. Such writing and drawing must have felt spontaneous, or, as Blake says in Europe, “dictated.” The time spent executing and printing illuminated plates was, in other words, far less than is often imagined. In fact, the most time-consuming aspect of production was biting the plates in acid and preparing the studio and materials. With that done, it would have been inefficient to print or paint only one impression per plate—or one copy of a book.47↤ 47 Blake’s comment in 1827 about needing six months to print a copy of Songs was seriously qualified with “consistent with my other Work,” and cannot be taken to reflect his practice or abilities 30 years earlier, when he was not “shut up in a Corner” but had a “whole House to range in,” i.e., was set up to print, physically and mentally, in that the illuminated books in the early 1790s were his primary creative work (K 878). Equally important, in 1827 he was no longer just washing impressions, but rather painting them elaborately, which took more time and attention. The coloring of most books produced before 1795 and not color printed is simple, consisting of a few washes; for example, the five broad washes in “The Lamb” of Innocence copy B probably represent no more time and labor than it took to ink and print this plate one time, since those acts involved applying ink to the plate with a dabber, which had to be handled carefully to keep it from touching the shallows, wiping the borders, registering the plate on the bed of the press and registering the paper to the plate, and pulling the bed through the rollers. For plates like “School Boy” and “Holy Thursday,” laying in simple washes would have taken far less labor than inking and printing. Nor do Blake’s late comments accurately describe his late practice, which may seem to have been to print and color books by order, “having none remaining of all that [he] had Printed” and little room to do otherwise, but actually conformed to his earliest practice of printing in editions, albeit smaller ones, as is evinced by the material and stylistic features shared by the last copies of Songs, copies V, Z, and AA, Visions, copies N, O, P, and Thel, copies N and O (see n. 51). 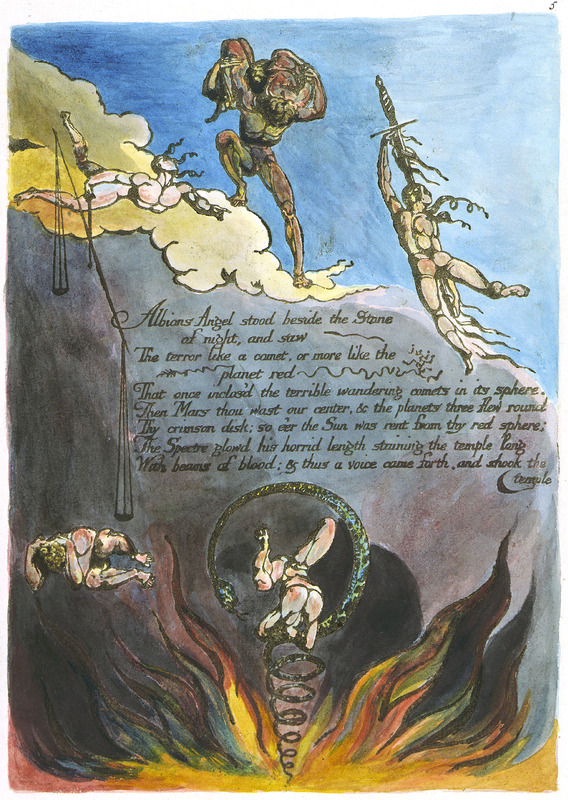 Given that the work involved in executing and printing The Song of Los, Book of Ahania, and Book of Los was minimal, and that Blake’s known outside commitments in 1795 were the fewest in years, it is not unreasonable to suppose that these three books, which mark the end of color-printed illuminated books, were all executed and printed before Flaxman’s copy of Experience—were executed, in other words, in “early 1795.”48↤ 48 What little information that exists about Blake’s activities for 1795 is nearly all in Stedman’s journal and does not reveal Blake’s work schedule (BR 49). It appears that Blake executed only three small frontispieces that winter and spring, finishing them by March and May (BR 614). The year before that he had no commissions other than six outlines for Cumberland’s Thoughts on Outline (1796); conversely (and understandably), Blake produced and printed more illuminated plates in 1794 than any other. It is important to understand that printmaking and printing were Blake’s life, that he was not a poet lucky enough to know how to etch or unlucky enough to have to leave off writing and make time to print. It is also important to recognize the fallacy of Cunningham’s popular depiction of Blake as a man working for the publishers by day and for himself at night (BR 484, 501). The truth is that Blake worked at home and structured his own time, worked on book illustrations, which were relatively small and syntactically uncomplicated compared to separate plates, i.e., reproductive engravings after paintings, like his “Beggar’s Opera” of 1788 after Hogarth. Indeed, with the possible exception of two etchings and an engraving after Fuseli (c. 1790? BR 612), Blake did not execute any separate commercial plates between 1789 and 1795, the period of illuminated printing, and, as mentioned, appears to have had a good deal of time on his hands in 1794 and 1795. Had Blake started the Night Thoughts designs in 1795, as Butlin believes, he would most likely not have begun till after he printed his last books and the monoprints, since that enormous project would have necessitated rearranging his work-space as well as his time. 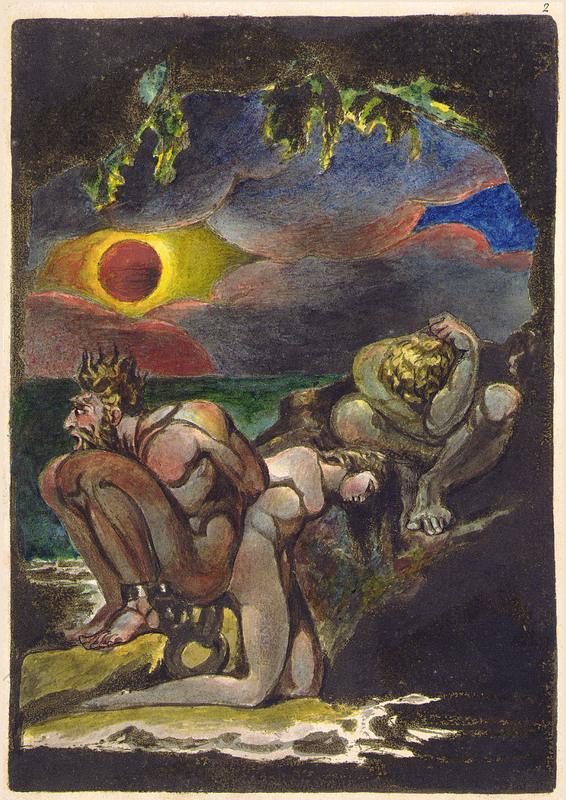 That painting and printing made different practical demands Blake made clear in his refusal in 1808 to reprint illuminated books, fearing “that it is impossible for me to return to [them] without destroying my present course,” “which in future must alone be devoted to Designing & Painting” (K 865-66). Romney’s and D’Israeli’s books, I believe, were produced together and part of a larger set (or project) in the same one- or two-month period, after The Book of Ahania and Book of Los and before the new edition of Experience. The bibliographical evidence suggests that Blake did not print in the ordinary manner while also color printing. Even the Experience plates of Songs copies B-E were lightly color printed, whereas Urizen copy B and Europe copies A and H were not. The use of a second ink to create shade, as in Thel copy F and Marriage copy D, appears to be a holdover from color printing and not an anticipation. Wiped borders, characteristic of books produced before and during color printing, but abandoned with the edition of Songs that Flaxman’s Experience belongs to, were another holdover. On the other hand, the subtle streaking that frames texts in Thel copy F, Marriage copy D, and Visions copy G appears to anticipate the more overt and stylized use of streaking and borders as frames characteristic of the copies of Songs in that edition. I am assuming, in other words, that practice was consistent and mutually exclusive, which may appear an odd thing to assume about an artist as innovative as Blake, yet it is merely to admit the causal relation between printing style (ink, inking, printing format) and production—that the former is the natural result of practice, involves the repetition of form and/or materials characteristic of printing sessions and/or editions, as well as of artistic interests of the moment, by which I mean at most a few weeks’ work in the studio, and not the many years that are generally thought to constitute the historical period for these early productions. Indeed, my other assumption, which is, like the first, based on my experience as a printmaker, is that the uninterrupted work involved in printing 160 plates not requiring à la poupée coloring, incised lines to be filled with ink, or surfaces to be inked and then wiped clean, was about 7 to 10 days.49↤ 49 Though D’Israeli’s copy of Visions, copy F, was not printed with the set, Visions copy G was, which keeps the number at 160; in addition to these 160 plates there were the 23 small plates of All Religions copy A and No Natural Religion copy L, and with more than one impression printed from the America, No Natural Religion, Europe, and possibly Songs plates, there may have been about 275 impressions. The estimate of 7 to 10 days to print these plates is based also on the experience of Paul Ritchie of the Manchester Etching Workshop, who printed the Workshop’s Blake facsimiles of Songs copy B in 1983. According to Ritchie, if Mrs. Blake was the “clean-hand person,” then this estimate is very charitable. Working together, “100 uncolored relief prints of Songs could be done in a day and the 180 larger America prints [10 copies] could easily be done in 3 days”—and this would include “a pint & a pie at lunchtime” (private correspondence). Again, it must be remembered that once the shop was set up, printing small relief plates was relatively easy, that printing was what Blake and Mrs. Blake did for their material and spiritual livelihood, and that my estimate of 30 to 40 impressions a day supposes a mere three to five impressions an hour, an output easily reached even with intaglio plates and color printing. In preparation for this article, I printed two of the electrotypes we used in the Manchester Etching Facsimile of Songs. Working alone and with a linen dabber, I printed 30 impressions, 15 from each plate, in two hours. The relation between practice and style is beyond the scope of this essay, but suffice it to say that Blake’s practice only seems inconsistent because his mode of production and its effect on dating are poorly understood, obscured by our focus on differences instead of similarities (by which style is defined and discernible) and our assumption that artifacts as unique (and valuable) as illuminated books must have been produced uniquely, that is, one at a time. I also think that production of this set of books followed The Book of Los and Book of Ahania closely because, together with a copy of Song of Los (assuming one had been recently printed), they not so coincidentally represent Blake’s entire published canon in relief etching up to this time. With color printing, the creation myth as then formulated, and relief etching all having run their course with or before The Book of Ahania and Book of Los, it is not difficult to imagine Blake wanting to consolidate his own best works. He would have done so, forming a deluxe set of large paper copies of his illuminated books, by reprinting the plates of All Religions (A), No Natural Religion (L), Thel (F), Marriage (D), Visions (G), America (A), Songs (A), Europe (A), and Urizen (B) in the same format, with the same inks, and on the same size paper.50↤ 50 America may have been reprinted because there were no copies in stock on one side of the sheet; Europe, on the other hand, may have been reprinted because copies B and C, which were color printed on one side of the leaf (though probably with recto-verso copies D-G, see n. 43), did not match the copies of America texturally or were already sold. Cumberland, one of Blake’s earliest collectors, owned Europe copy C; Hanrott owned Europe copy B, which was not necessarily purchased early or directly from Blake. Hanrott bought Songs copy P in 1826 from another collector (BB 419), and his copies of America (G), Europe (B), and Jerusalem (B), which were bound possibly as early as 1821 (the date of a flyleaf; BB 102), may also have been purchased late. As with D’Israeli, there is no evidence other than the books themselves to suggest Hanrott knew or met Blake. This appears to have been the first time he printed across titles, that is, various titles in the same printing session, but not the last.51↤ 51 Blake was to print the canon in this fashion, that is, print various books around the same time using the same paper, printing format, palette, and inks, in c. 1815 and 1825, apparently to replenish stock. For example, he printed copies of Marriage (G), Visions (N, O, and P), Thel (N, O), Milton (D), Urizen (G), and Songs (U, T2) all on the same Ruse & Turners / 1815 paper and in the same shades of reddish brown and orange ink. All of these copies except Thel copy O and Milton copy D, which were stabbed together for Vine, have a similar single frame line outlining the plates. The technical, material, and stylistic similarities suggest that these copies were produced in the same printing sessions. An early 1795 date of production for the entire set of books means that America copies A and B are not 1800 and 1799, Thel copy F is not c. 1806, Europe copies A and H are not 1805 and 1800, Marriage copy D is not begin page 65 | ↑ back to top 1794 and before color-printed copies E and F, Songs copy A is not 1789-1800, and Visions copy G is not 1796-1800 (BB 87, 118, 146, 288, 382, 465). The 1795 date also implies that washed texts and page numbers do not automatically signify post-1800 production, that coloring was rarely separated from printing, and that illuminated books were color printed before the monoprints and Books of Designs. That the Books were color printed c. 1796 does not mean that color printing had remained Blake’s standard printing technique through 1795 and 1796; it suggests, rather, that Blake used an earlier and special technique that was warranted (and financially guaranteed) by commission, a technique that may have been especially requested, since Humphry owned two color-printed works (Europe copy D and Songs copy H). They were probably color printed because they were conceived in the manner of the color-printed monotypes, i.e., as a portfolio of miniature paintings and not books (see n. 38). The new documentary evidence regarding Romney’s ownership of illuminated books may simply support a long-held assumption, that Romney knew and patronized Blake. But it overturns the assumption that D’Israeli was an early patron and collector. Equally important, this new evidence reveals how tenuous our assumptions are regarding patronage and the earliest modes by which illuminated books were produced and disseminated. The idea that Blake “didn’t print editions; he printed only one copy at a time, as he got commissions” (Davids and Petrillo 154) is based on the idea that each illuminated book is unique and hence must have been produced as such. The individual letters given to copies of books to indicate the chronology of production express this assumption. Yet, the shared stylistic features and materials among copies of the same title prove just the opposite, that the books were produced in limited editions and, hence, that production could not have been motivated by commission. Unique coloring is no more synonymous with individual print production than purchase is synonymous with patronage or ownership with commission. Indeed, even Flaxman’s copies of Experience and Innocence, the latter of which was reported to have been “coloured by Blake for Flaxman,” were, like nearly all illuminated books except a few late copies, merely purchased from those “in hand.”52↤ 52 Christie’s catalogue of 1876 (BB 405). Innocence copy D was probably produced in 1789, but no later than 1793, yet Flaxman returned from Italy late in 1794. Innocence copy C was said by R. H. Shepherd to have been “executed” for Samuel Rogers (BB 405n2). Both cataloguer and critic equate ownership with commission. The illuminated books belonging to Romney and D’Israeli, which at first appear certainly to have been commissioned, presumably by Romney, if for no other reasons than their being different from others of their kind and like one another, were produced in the same printing sessions and also purchased from stock. If, on the other hand, they were “printed only one . . . at a time, as [Blake] got commissions,” then the history of and motivation for the copies stylistically matching Romney’s volumes but not in his collection are puzzling, as is the inclusion of Visions copy F, since it was printed before the others. That more books were produced than purchased suggests that they were not produced to meet a single commission; that Visions copy G was purchased by someone other than Romney suggests the same and that it either was sold before Romney examined Blake’s stock or simply did not appeal to him as much as Visions copy F. In either case, it appears that Romney purchased not what he specifically commissioned but what Blake had already produced. This reading of the evidence is further supported if, as is likely, Flaxman played agent. For if Flaxman showed Romney his own illuminated books and “recommended . . . [his] friend to take copies,” then Romney would have purchased his books after Flaxman purchased his, that is, after “early 1795,” and thus from a set already produced. When illuminated books such as these, which because of the similarities among themselves and their differences from other copies appear so obviously to have been commissioned, can be shown to have been produced for other reasons, then the assumption that production was “on demand” (Essick, “Materials” 857) and “with a particular customer in mind” (Erdman, Poetry and Prose 786), is undermined: copies closely resembling one another in materials, printing, format, and coloring, like most copies of Thel, Innocence, Visions, America, Europe, and Song of Los, are even less likely to have been produced by commission. The less likely commission becomes, the more likely it becomes that illuminated books were printed in small editions. Romney probably purchased his four books directly from Blake at one time, before any other “friend” came by; D’Israeli or, more likely, an unknown intermediary collector, may have done the same with Marriage copy D, Europe copy A, and Thel copy F. In both cases, books were purchased from a deluxe—or display—set, a set that helped to comprise and to sell the “numerous great works now in hand” which Blake offered to friends, patrons, and collectors “at a fair price” (K 208). Balston, Thomas. James Whatman Father & Son. 1957. New York: Garland Publishing, 1979. Bentley, G. E., Jr. Blake Records. Oxford: Clarendon, 1969. —. Blake Books. Oxford: Clarendon, 1977. —. William Blake’s Writings. Oxford: Clarendon, 1978. —. Introduction. Europe: A Prophecy. By William Blake. The American Blake Foundation: Memphis State U, 1978. Bindman, David. Blake as an Artist. London: Phaidon, 1977. —, ed. Catalogue of the Collection in the Fitzwilliam Museum Cambridge. Cambridge: W. Heffer and Sons Ltd., 1970. —. The Complete Graphic Works of William Blake. London: Thames and Hudson, 1978. —. William Blake: His Art and Times. Yale Center for British Art, London: Thames and Hudson Ltd., 1982. Butlin, Martin. “The Physicality of William Blake: The Large Color Prints of ‘1795’ ” The Huntington Library Quarterly 52 (1989): 1-17. —. The Paintings and Drawings of William Blake. New Haven: Yale UP, 1981. Chamberlain, Arthur B. George Romney. London: Methuen and Company, 1910. Cohn, Marjorie B. Wash and Gouache: A Study of the Development of the Materials of Watercolor. Published by The Center for Conservation and Technical Studies, Fogg Art Museum, 1977. Davids, B. and J. Petrillo: “The Artist as Book Printer: Four Short Courses,” Artists’ Books: A Critical Anthology and Sourcebook. Ed. Joan Lyons. New York: Gibbs M. Smith in association with Visual Studies Workshop Press, 1985. Dayes, Edward. The Works of the Late Edward Dayes. London, 1805. Dibdin, T. F. The Library Companion. London, 1824. —. Reminiscences of a Literary Life. London, 1836. —. Index to the Rev. Dr. Dibdin’s Reminiscences of a Literary Life (44 pages). nd. np. 1836? Dörrbecker, D. W. “The Song of Los: The Munich Copy and a New Attempt to Understand Blake’s Images.” The Huntington Library Quarterly 52 (1898): 43-73. Erdman, David V., annot. The Illuminated Blake. Garden City: Anchor-Doubleday, 1974. —, ed. The Complete Poetry and Prose of William Blake. New Rev. Ed. Garden City: Anchor-Doubleday, 1982. Essick, Robert. The Separate Plates of William Blake, A Catalogue. Princeton: Princeton UP, 1983. —. William Blake, Printmaker. Princeton: Princeton UP, 1980. —. “The Resurrection of America Copy R.” Blake / An Illustrated Quarterly 21 (1988): 138-42. —. 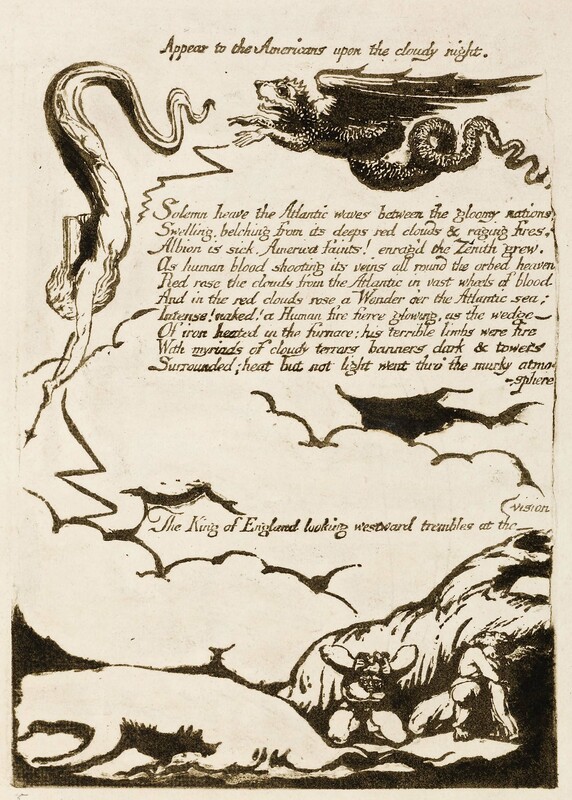 The Works of William Blake in the Huntington Collections. San Marino, CA: Huntington Library, 1985. —. “William Blake, William Hamilton, and The Materials of Graphic Meaning.” English Language Notes 52 (1985): 833-72. Gilchrist, Alexander. The Life of Blake. 2 vols. London: MacMillan, 1863. Grant, John. “Review Article: Who Shall bind the Infinite and Arrange It in Libraries? William Blake’s Writings and Blake Books.” Philological Quarterly 61 (1982): 277-304. Hagstrum, Jean. “Romney and Blake: Gifts of Grace and Terror.” Blake in His Time. Ed. Robert N. Essick and Donald Pearce. Bloomington: Indiana UP, 1978. Jackson, William Alexander. Records of a Bibliographer. Cambridge: Harvard UP, 1967. Keynes, Geoffrey and Edwin Wolf, 2nd. William Blake’s Illuminated Books: A Census. New York: Grolier, 1953. Ogden, James. Isaac D’Israeli. Oxford: Oxford UP, 1969. Romney, John. Memoirs of the Life and Works of George Romney. London: Baldwin and Cradock, 1830. Shepard, Richard Herne. 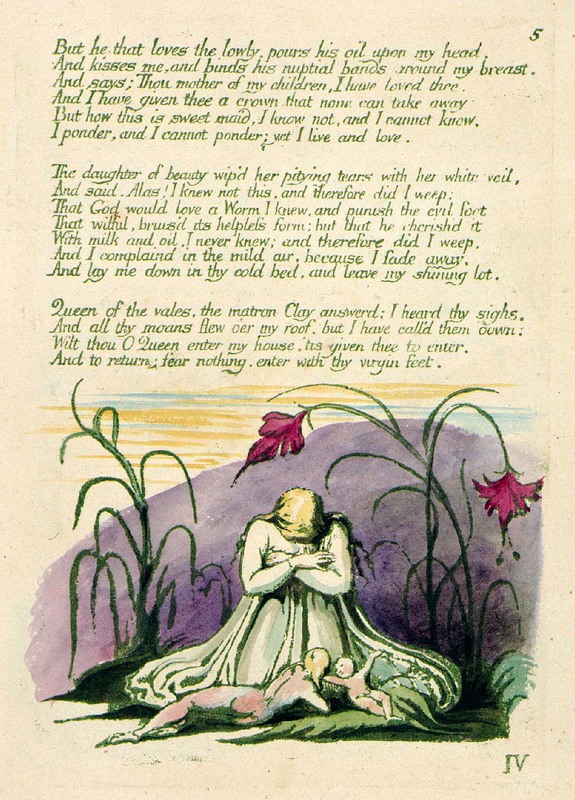 “Blake’s Songs of Innocence.” Academy 7 (1875): 636. Smith, J. T. Nollekens and his Times. 1828, in Blake Records. Todd, Ruthven. William Blake, the Artist. London: Studio Vista, 1971. Tyson, Gerald P. Joseph Johnson: A Liberal Publisher. Iowa City: U of Iowa P, 1979. Viscomi, Joseph. Art of William Blake’s Illuminated Prints. Manchester: Manchester Etching Workshop, 1983. —. “Recreating Blake’s Illuminated Prints: The Facsimiles of the Manchester Etching Workshop.” Blake / An Illustrated Quarterly 19 (1985): 4-23.